The older XBEE modules S2 & S1 are not capable of communicating with each other. S2 can talk only to S2 , S1 with S1 .You cannot mix the modules. 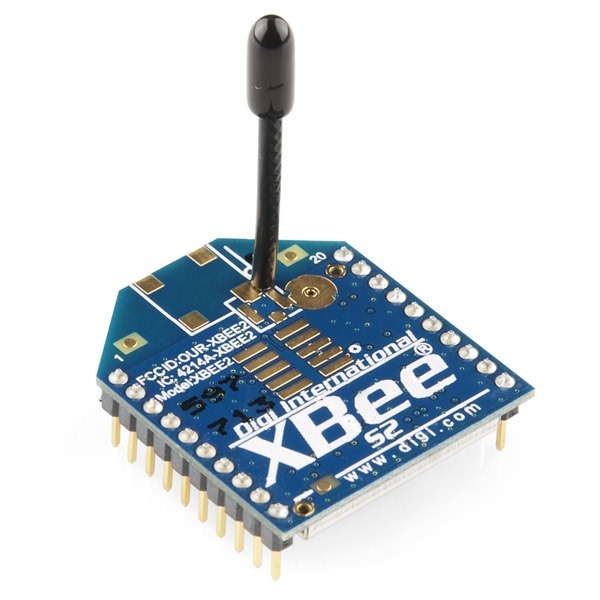 The new XBEE S2C is capable of communicating with S2 as well as S1 modules. 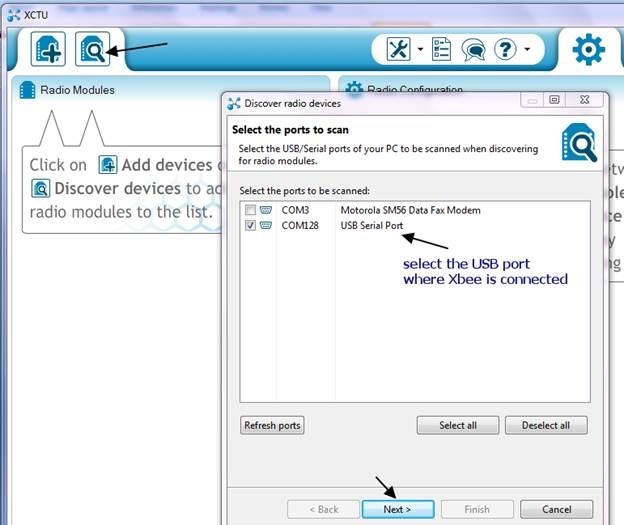 Place an XBEE S2C module on USB adapter & plug on to USB port of your Laptop.Open the XCTU & search for the radio.Once the radio is detected , select it & load the settings. The product family is XB24C & the Function set is ZIGBEE TH Reg. (Through Hole Regular). The PANID is set to 1234. The same PANID to be set for the other Radio also.The Destination LOW address is FFFF which makes the Radio to BROADCAST mode. NI is Node Identifier which you can name it as COORDINATOR. Click on the PENCIL icon on top to WRITE the settings made. Now plug the S2 module on another USB adapter & plug it to other USB port . Search for the Radio & select it. Load the settings & click on the UPGRADE FIRMWARE button. Click on FINISH button to complete the upgrade action. Set the PANID as 1234 , same as that of COORDINATOR. JV is ENABLED , so that the radio joins Coordinator on power on. DL is set to 0 , which is the default address of coordinator. Now the S2 module is configured as Router. Leave this module on the XCTU & close the Coordinator module. 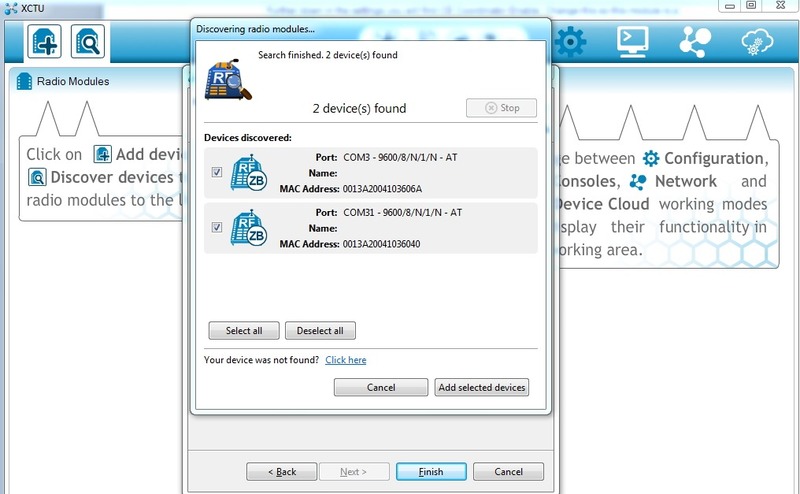 Start another instance of XCTU window & search for the COM port , select the Coordinator Radio. Place the XCTU windows side by side.Coordinator to the left & Router to the Right. Click on the Terminal icon on the top & then click the SERIAL connect icon.The open Serial icon now changes to a closed one.Do this on both the windows. Now pull out the S2 module from USB adapter & replace it with S1 module. S2C is left on the same USB port. 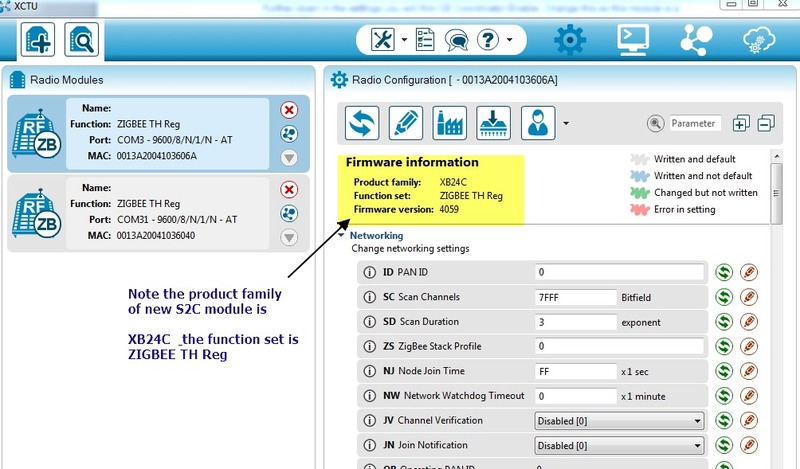 S2C module is to be upgraded Firmware 802.15.4TH . 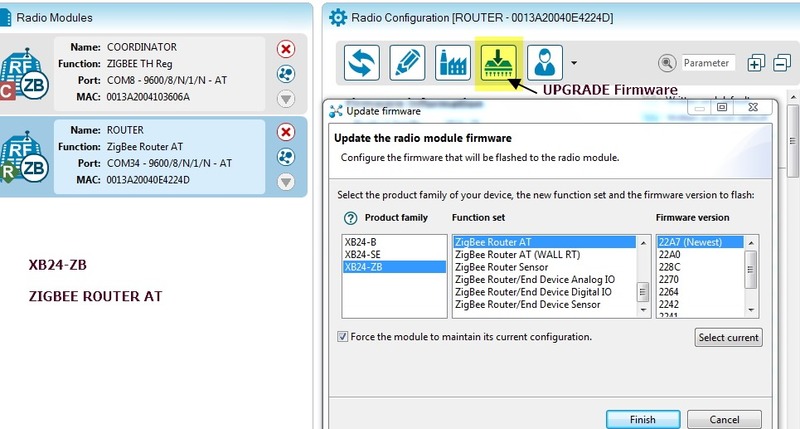 Click on the Upgrade Firmware icon & select XB24C –> 802.15.4 TH & the latest version. 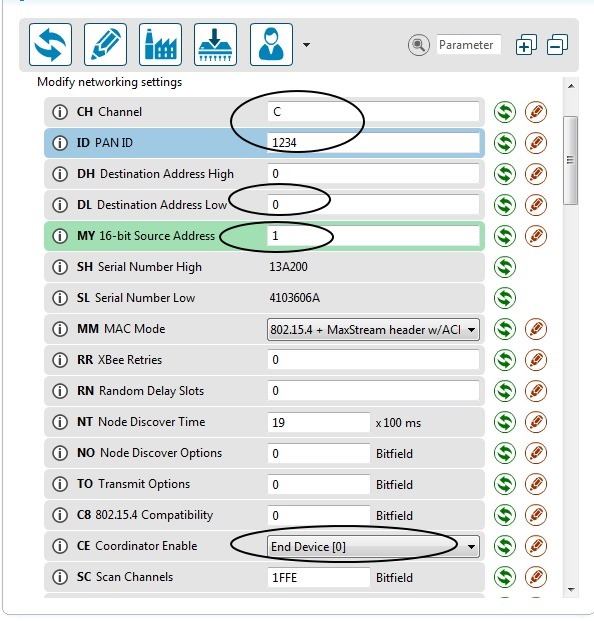 The CHANNEL is left to default C.
Now start another instance of XCTU & select the COM port where S1 is plugged on. Select the Radio & load the settings. Click on WRITE button to save the changes made. Place both the XCTU windows side by side. Click on TERMINAL icon & then SERIAL Lock on both the windows. Test for communication by typing some message which appears on the other window. DIGI International has recently introduced the new ZIGBEE S2C Module .The previous S2 & the traditional S1 both are discontinued. The new module is powerful with both UART & SPI communication . The Module is faster and has more RAM & flash memory with much reduced power consumption. Increases the mesh capabilities & consumes under 1 micro amp sleep current. Here is the comparison chart of S1 , S2 & S2C .The Indoor/Outdoor range of S2C has also increased much more as the transmit output power is double.Also it works on supply voltage from 2.1v to 3.6v DC. ZigBee defines three different device types: coordinator, router, and end device. 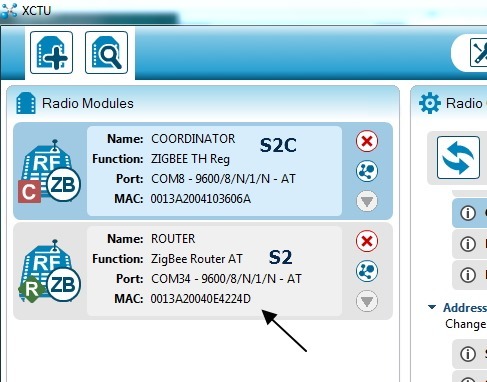 ZigBee networks always have a single coordinator device. 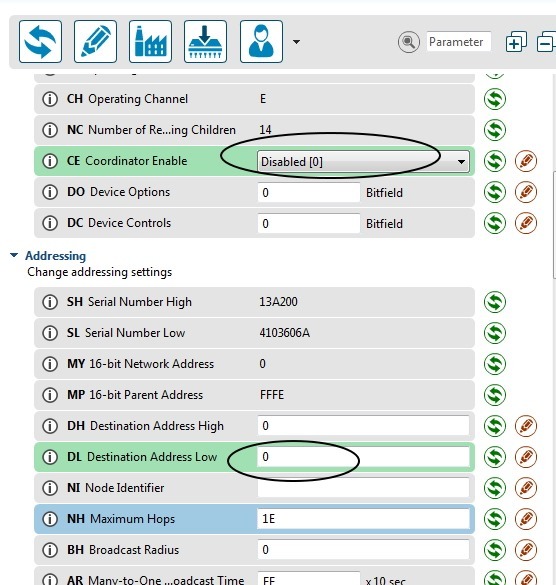 This device Starts the network, selecting the channel and PAN ID.Distributes addresses, allowing routers and end devices to join the network.Buffers wireless data packets for sleeping end device children. The coordinator manages the other functions that define the network, secure it, and keep it healthy. This device cannot sleep and must be powered on at all times. A router is a full-featured ZigBee node. 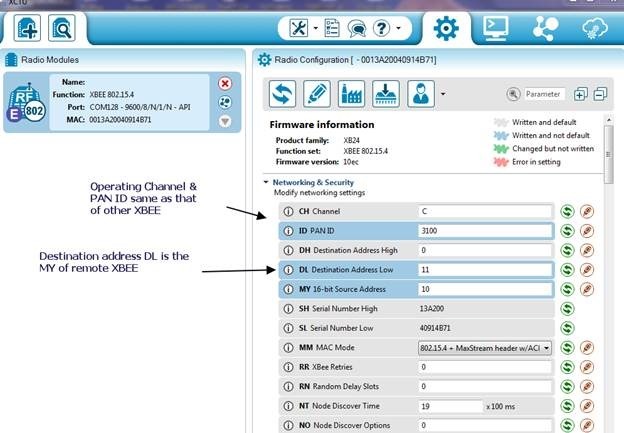 This device can join existing networks and send, receive, and route information. Routing involves acting as a messenger for communications between other devices that are too far apart to convey information on their own. An end device is essentially a reduced version of a router. This device can join existing networks and send and receive information, but cannot act as messenger between any other devices.Cannot allow other devices to join the network. Uses less expensive hardware and can power itself down intermittently, saving energy by temporarily entering a nonresponsive sleep mode.Always needs a router or the coordinator to be its parent device. The parent helps end devices join the network and stores messages for them when they are asleep. ZigBee networks may have any number of end devices. 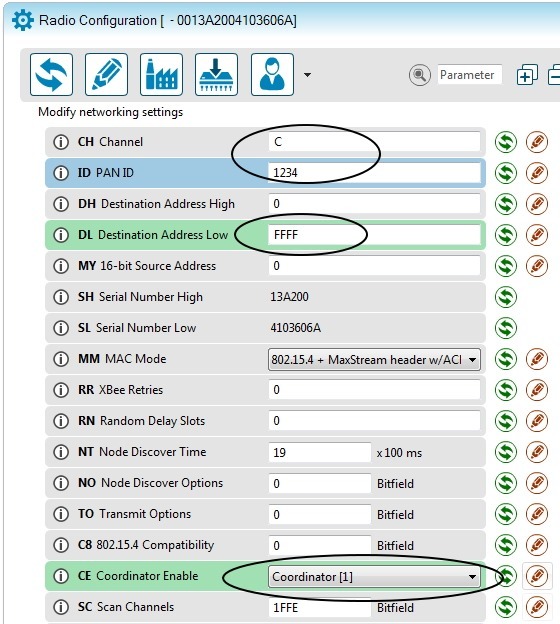 In fact, a network can be composed of one coordinator, multiple end devices, and zero routers. Now let us practically see how to configure the Radio S2C. 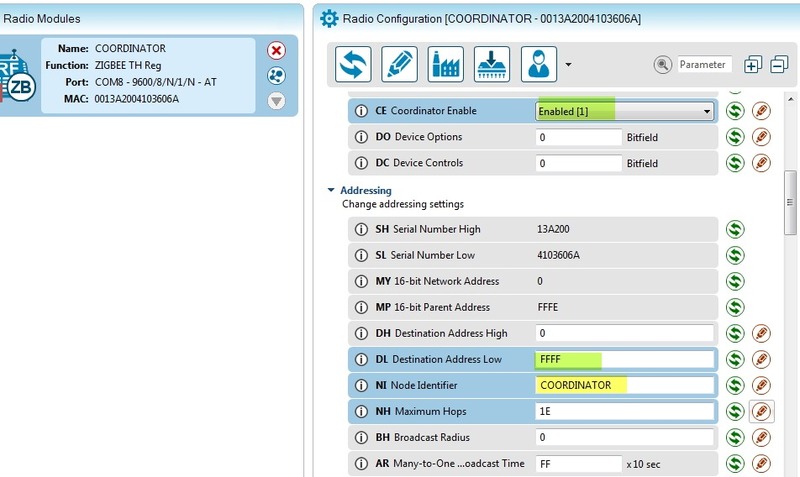 For communication one of the Radios to be configured as COORDINATOR & the other one as Router. Following is the pin configuration of S2C. 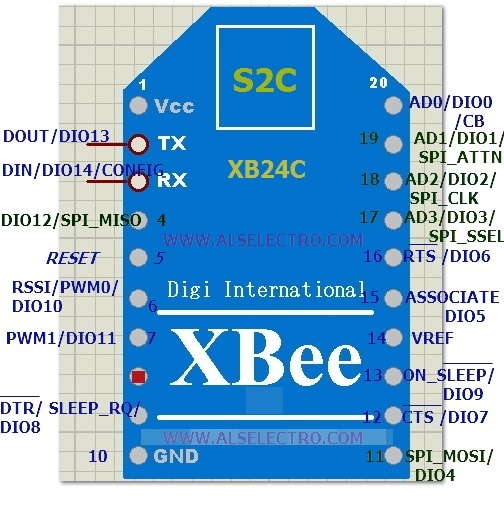 To configure the XBEE you need an USB XBEE Adapter which can be easily connected to the USB port of your PC. 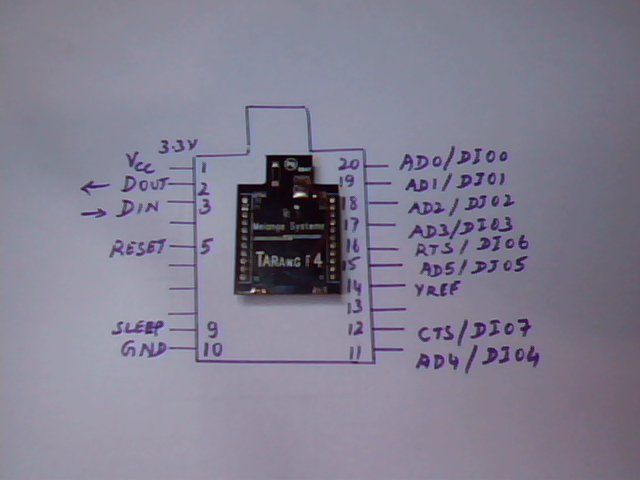 In case you do not have this USB board , you can use your Arduino board as USB-UART. 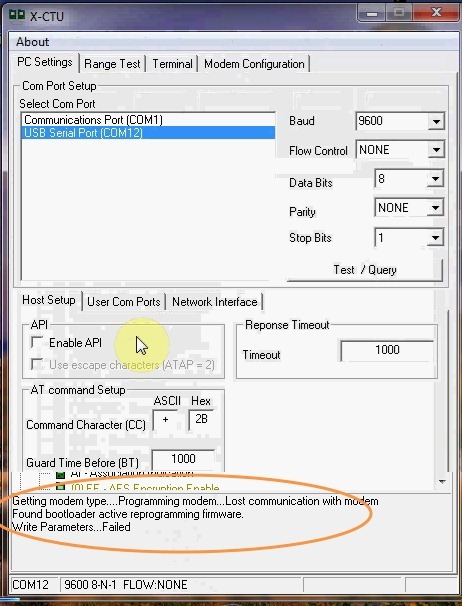 For this you need to connect RST of Arduino to GND.This bypasses the bootloader of Arduino & the board can be used for Serial communication.Remember to connect Rx to Rx , Tx to Tx (straight & NOT reverse connection) between Arduino & XBEE while configuring. Let us start with the configuration.Plug the S2C modules on to the USB adapters & connect to USB ports of your PC. 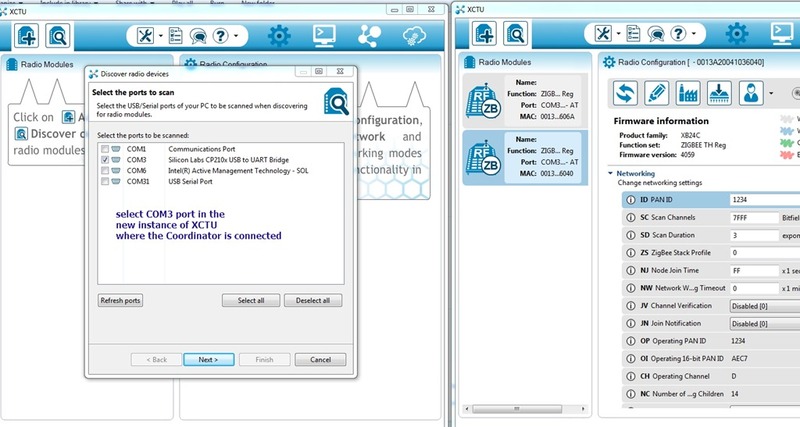 Open the new XCTU Software .S2C can be configured with this new XCT. The classic old XCtu does not support the S2C module. Click on the SEARCH icon on top to detect the USB ports. A list of active USB COM ports will be displayed. 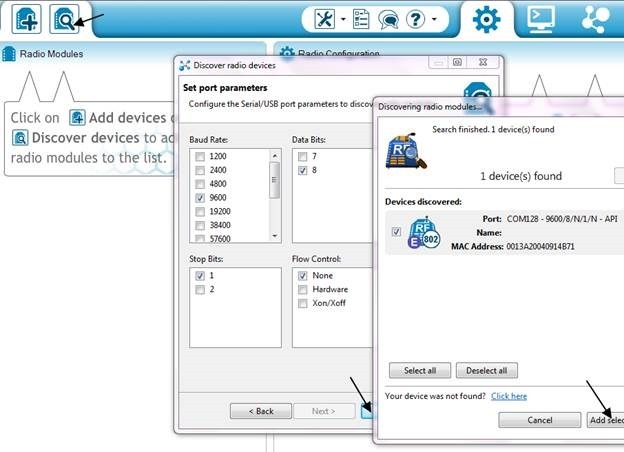 Select the COM ports where you’ve connected the USB adapters.To confirm you can verify your DEVICE MANAGER for the proper COM ports. In my case one of the USB adapter is allotted COM3 & the other one COM31. 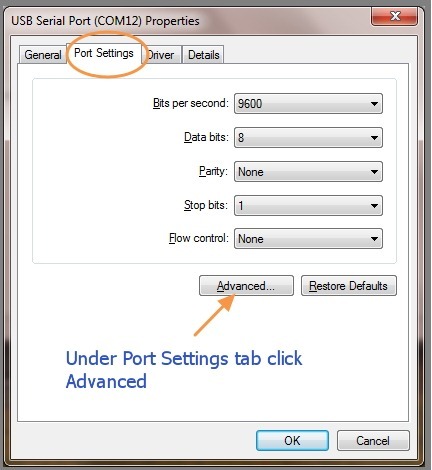 Click on NEXT & accept the default PORT PARAMETERS . 96008N1 is the default. 9600 is the BAUD RATE , 8 Data Bits, No Parity & 1 Stop bit. The XCTU scans the USB ports selected & lists the RADIOs found with their unique 64 bit address. Select both the devices & click ADD SELECTED DEVICES. Now both the Radios appear on the left pane. Let us configure the RADIO at COM3 as COORDINATOR first. 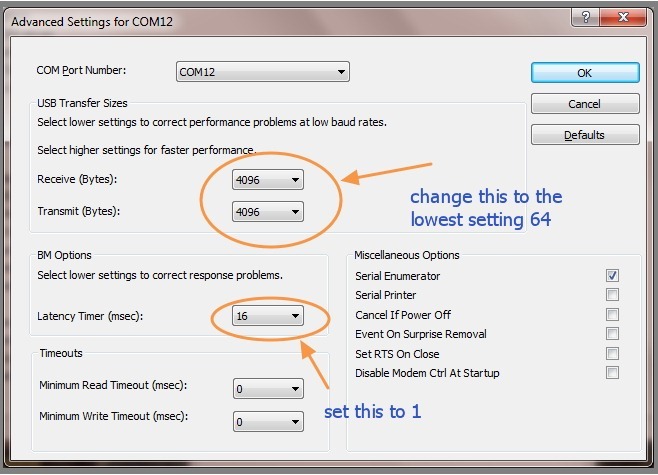 For this click on the COM3 RADIO to load the module settings. 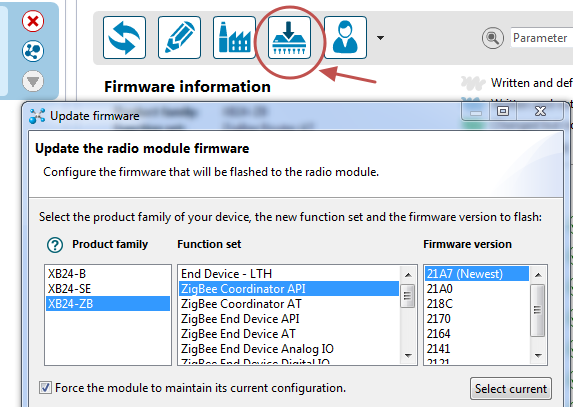 The function set of Firmware is ZIGBEE TH Reg , the Reg stands for Regular & not PRO. TH stands for THROUGH HOLE & not SMD. 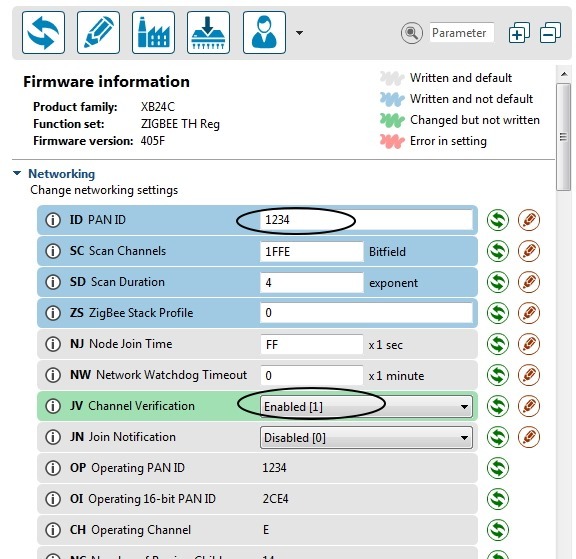 First thing is to set the PAN ID of the Network. This can be from 0 to FFFF hex.In my case I’m setting it to 1234.The other Radios also to be set in the same PAN ID. The Destination address DH is left to default 0. The Destination Address DL is set to hex FFFF which makes the Radio work on BROADCAST mode, so that it can communicate with all Radios in the same PANID. The Node Identifier can be given any name like “Coordinator”.This naming is optional. Click on the PENCIL icon on top to WRITE the changes made. 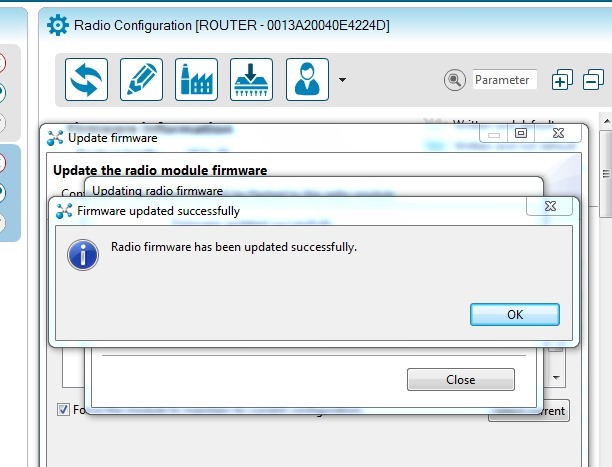 Now let us configure the second Radio as ROUTER. Click on the second Radio on the left pane to load the settings. The Router setting is quite simple. Enter the PANID as 1234 , same as that of Coordinator. The modules are paired & ready for communication. Now let us test the communication.On the XCTU window delete the second Radio .Click on the first Radio to load the settings. Leaving the XCTU window open , start another instance of XCTU &position it to the left of the previous window. Click on the Search button on the new instance of XCTU & select the second Radio . Click on the Radio selected to load the settings. Now the ROUTER Radio is on the left side & the COORDINATOR Radio to the Right. Click the TERMINAL icon on both the windows to enter Terminal mode. 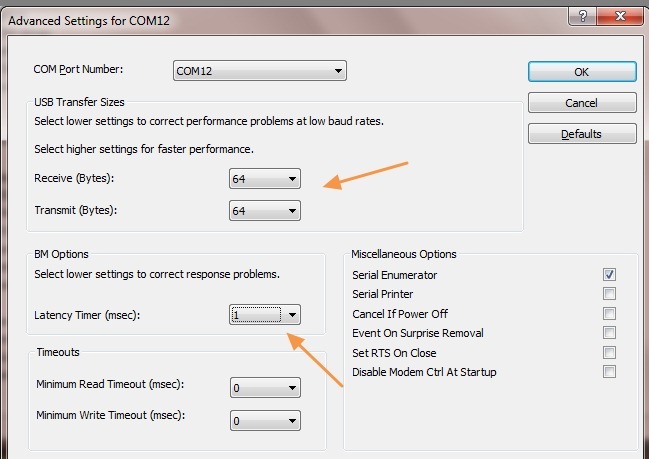 Click on the SERIAL CONNECTION icon on both the windows to enter the serial connection mode. You can see the SERIAL Icon in LOCK mode & the AT CONSOLE Status changes to CONNECTED. Now you can type any message inside console log window & see that received on the other Radio.The transmit message is in BLUE & received message in RED. Once the Function set is selected , click on FINISH to load the firmware. 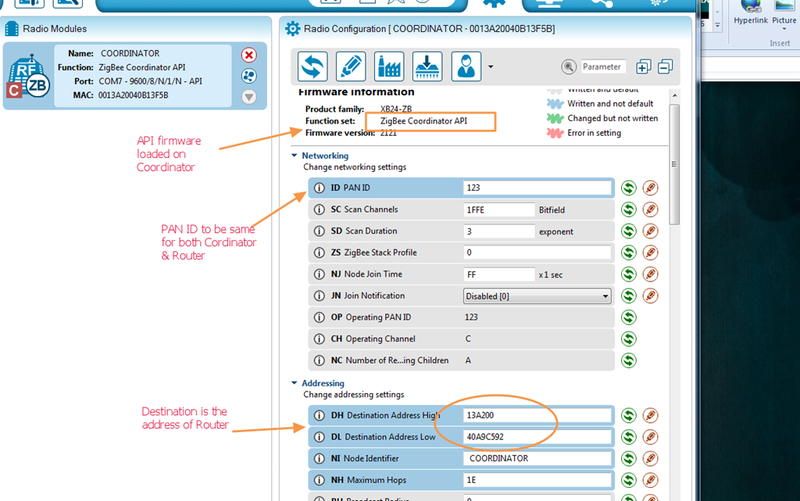 802.15.4 firmware is like that of our classic S1 module.But setting is slightly different. Click on WRITE button & test the modules for communication. 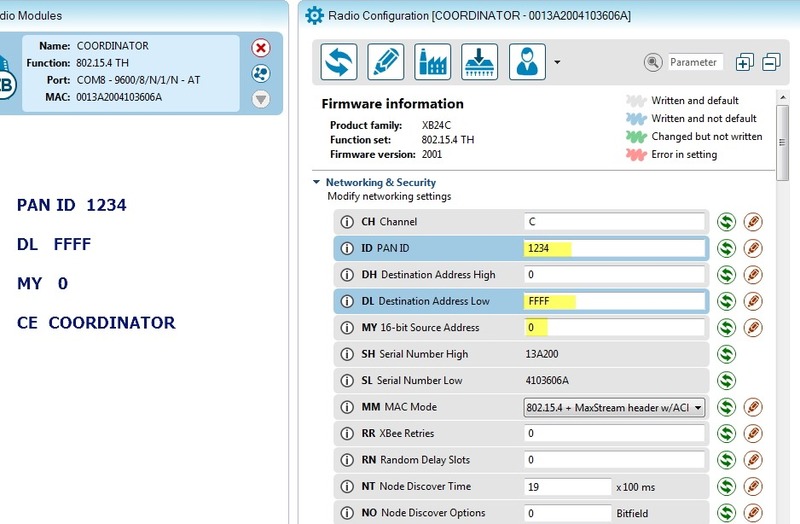 In this 802.15.4 Firmware POINT TO POINT communication only is possible & NO MESH Networking. In a nutshell, the new X2C module is powerful & can work as S2 or the old S1 module. Generally an USB explorer board is required to configure an XBEE .But the cost of this board is bit high as it has USB to UART IC. Your ARDUINO board comes in handy & here’s the trick ..
For a point to point data transmission S1 modules are handy as they are capable of Direct I/O transmission.You can connect a sensor node like a temperature sensor or door switch to an I/O pin of S1 module and program the other module to follow the changes happening to that I/O pin.The changes reflect at the I/O pin of the distant radio.No external Microcontroller is required for a S1 Direct I/O. 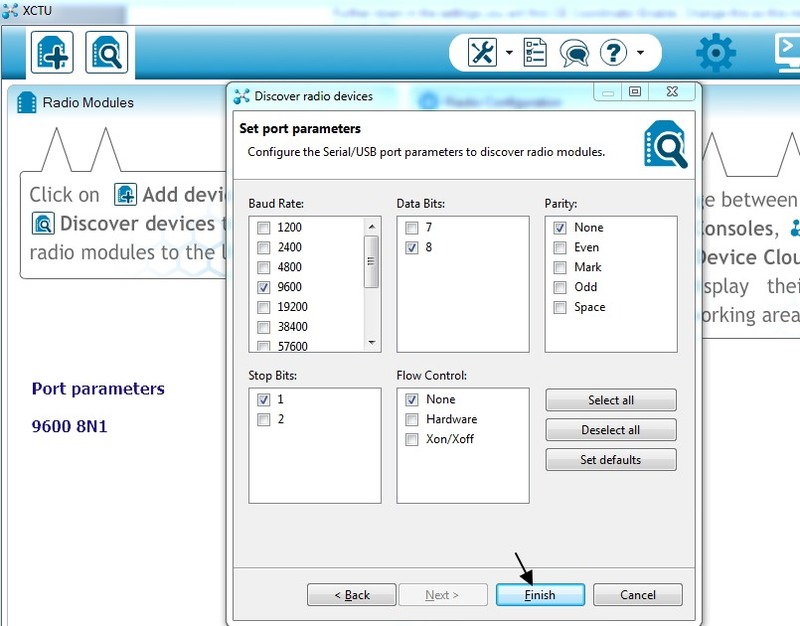 This I/O functionality is not possible with S2 modules.But this can be achieved by reading the API frames transmitted by the sensor node .The XBee Radio at the sensor node should be configured as a ROUTER or END device & the data collecting XBee should be configured with COORDINATOR API Firmware.For parsing the data received & decision making , a Microcontroller is required at the Coordinator end.Arduino is the best choice as it has access to powerful open source libraries. In this post we shall see how to collect data from a Digital input like a Door switch & how to parse the API frame data received from that sensor node . A Door switch is used as Digital input.The switch has 2 rectangle parts.The one with wires has a Reed switch molded inside. 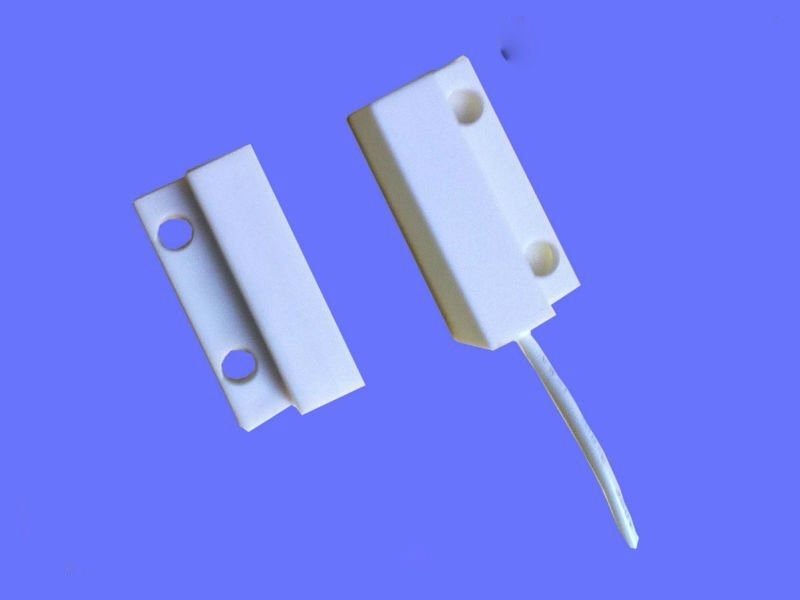 When a magnet is brought near the reed switch , the normally open switch gets closed.The part without wire has a small piece of magnet inside , which makes the reed switch on. The Door switch is connected to pin 20 (DIO_0) of distant xbee which is configured with Router AT firmware. 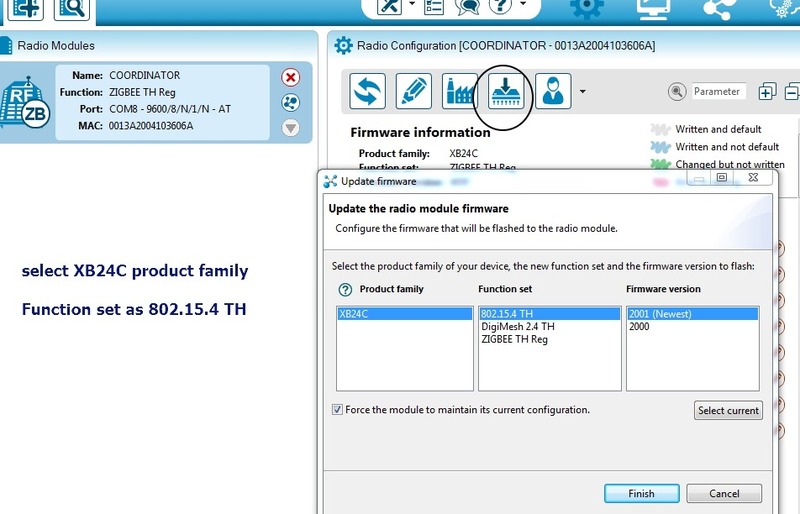 One of the Radios to be configured as Router.The Router radio is programmed with AT Firmware & the Destination address DH, DL is given as the Source address (Serial Number SH,SL) of Coordinator. 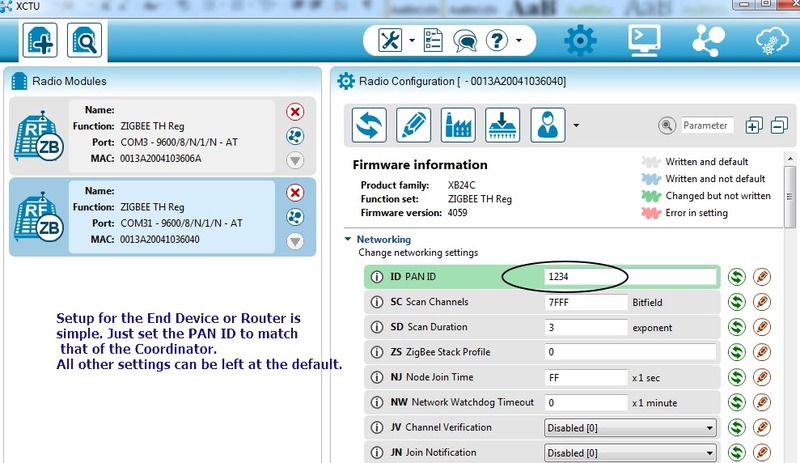 The PAN ID & Baud Rate should be same for both the Radios. Pin 20 – DIO 0 of Router is to be connected to the Door switch.This pin is declared as DIGITAL INPUT. 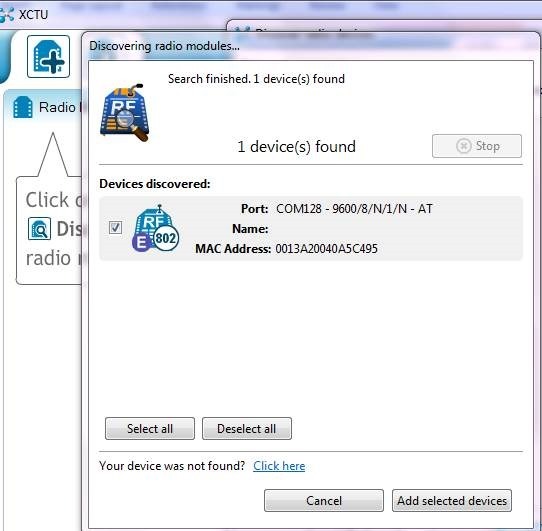 Plug one radio on to the USB breakout & connect it to PC.Open the new XCTU program & click on the Search icon on the top.The radio is identified & 64 bit Address is displayed along with the Firmware loaded. 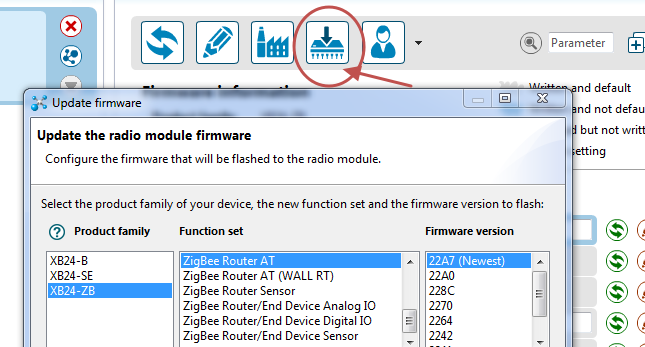 Click on the icon & update the Radio firmware as XB24-ZB / ZigBee Router AT. The Destination address is the Source address of other XBee.Enter the address under DH , DL as shown. 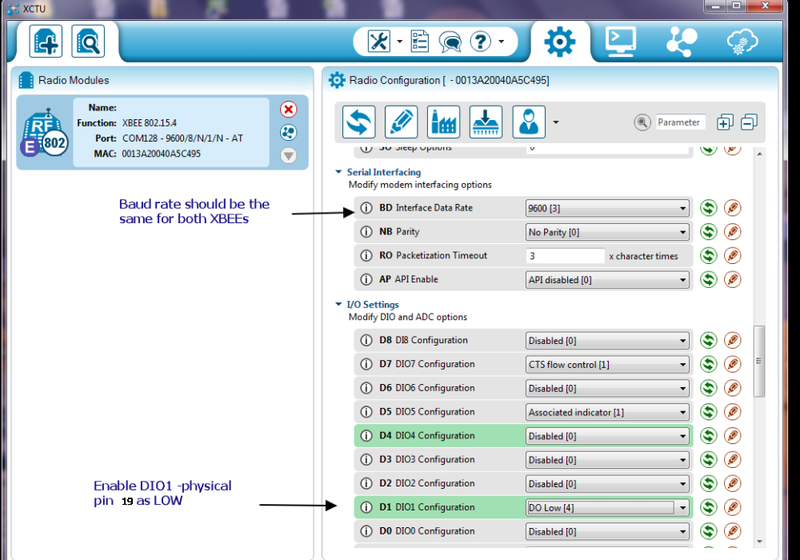 Scroll down further & under I/O settings change the D0 AD0/DIO0 configuration to 3 which represents Digital Input. Click on the Write button to record the changes done. Scroll down further to set the IR Sampling Rate.Set this to hex value 1388 which equals 5000 in Decimal.i.e a digital sample is sent every 5000ms or 5 secs. XB24-ZB / ZigBee Coordinator API firmware. 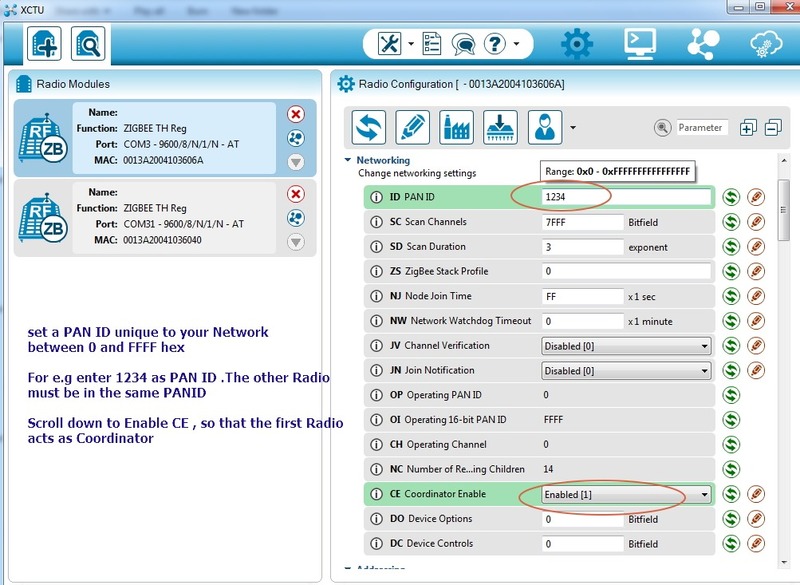 Ensure that the PANID (you can feed your own value ) & Baud Rate are the same for both the Radios. The Destination address is the Source address of Router as shown below . Scroll down further to set the API mode Enable (1). Click on Write to record the changes. Configuration of both Radios is completed now. 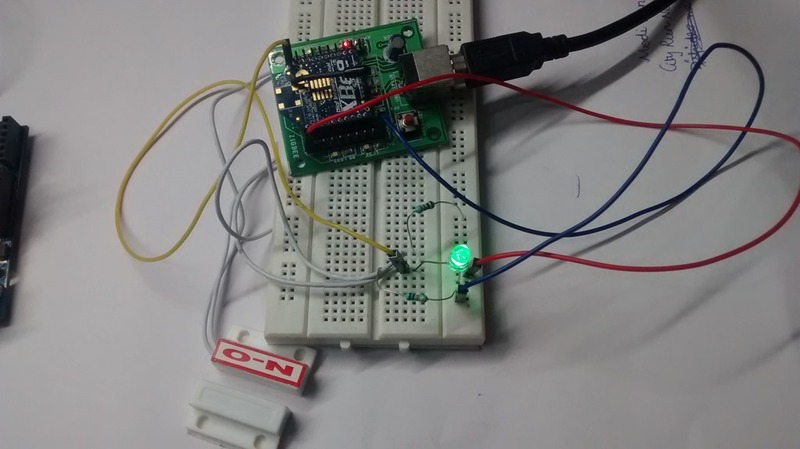 Pin 1 of breakout board is connected to 5v of Arduino & pin 10 to GND. As the breakout board has built in 3.3v regulator , its safe to provide 5v supply.Pin 2 (TX) of XBee breakout goes to pin 0 (Rx) of Arduino. 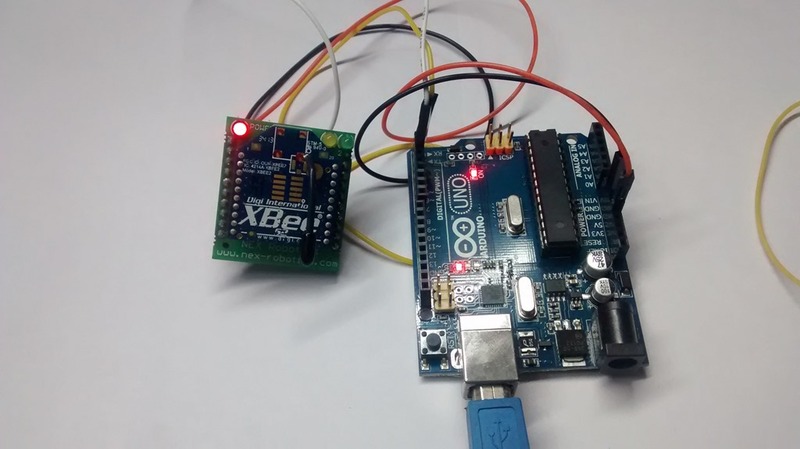 Pin3 (RX) of XBee goes to pin 1 (Tx) of Arduino. The Arduino board is connected to PC using USB cable. 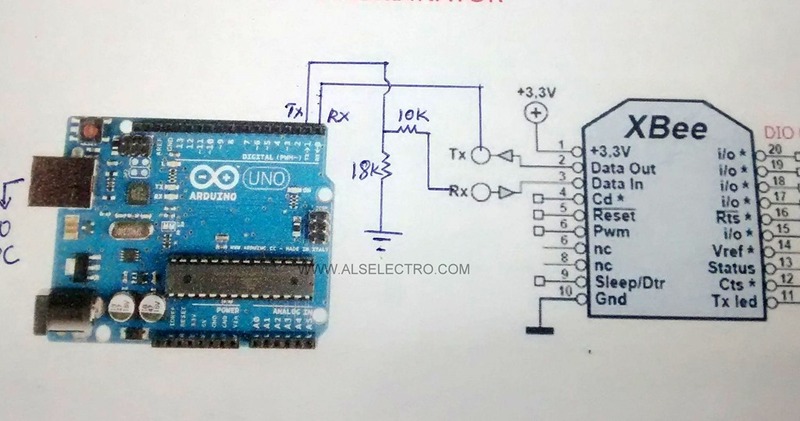 While connecting the Cordinator radio to Arduino it is advisable to use a Resistor network between Tx of Arduino & Rx of XBEE.This ensures that the voltage level ( which is TTL (5V) at Arduino Tx ) is acceptable around 3.3v at Rx of XBEE. 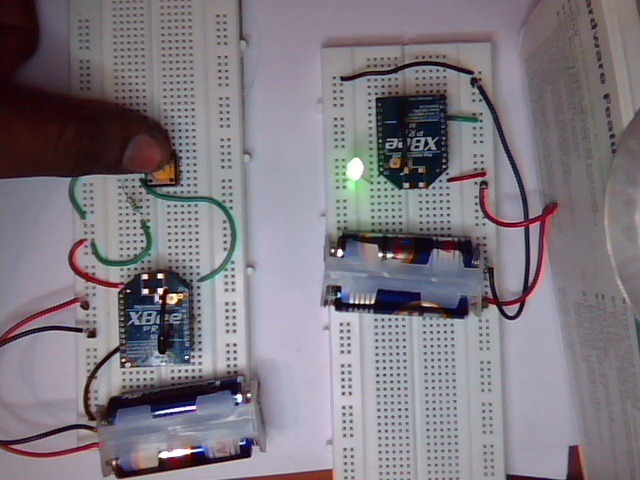 The Arduino considers 3.3v level from Tx of XBEE as HIGH.So there is no need of Resistors between Tx of Xbee & Rx of Arduino. 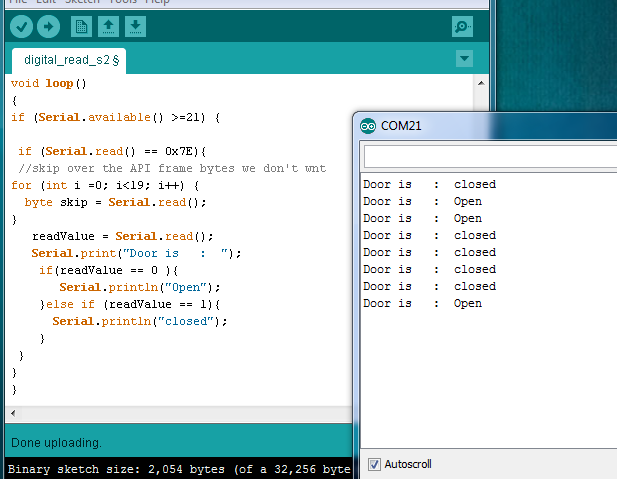 Now open the Arduino IDE & select the port where Arduino is connected.Upload the following Sketch . Remember to disconnect the wires at Rx/Tx pins of Arduino while uploading the Sketch. Now power up the Router by connecting the USB cable to the XBee USB breakout.Remember to switch on the Coordinator first & then the Router. As soon as the Router joins the Coordinator , it starts sending Digital samples collected from pin 20 every 5 secs. 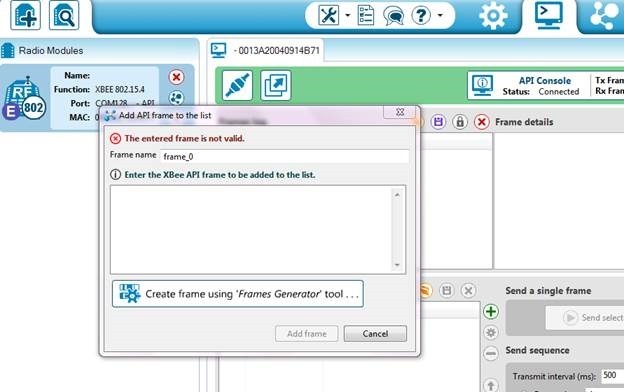 Open the Serial monitor of Arduino to view the API Frames received. 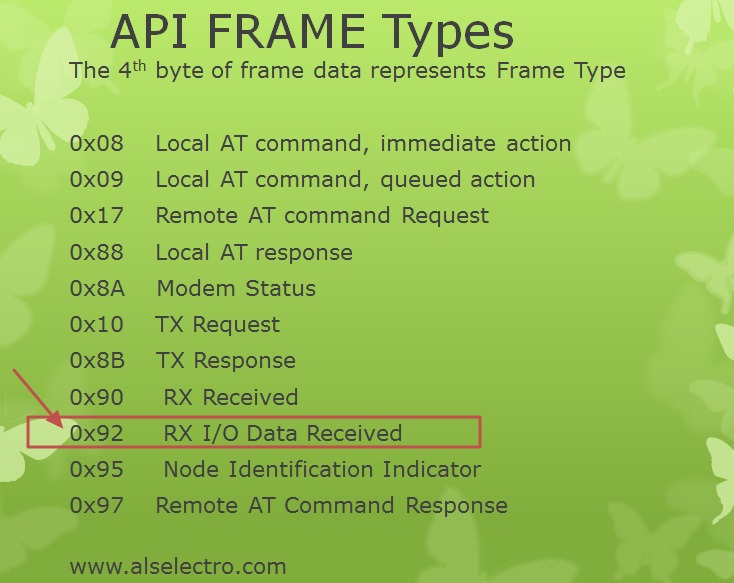 The API Frame consists of total 22 bytes (counted from 0 to 21) starting with a Delimiter 7E. 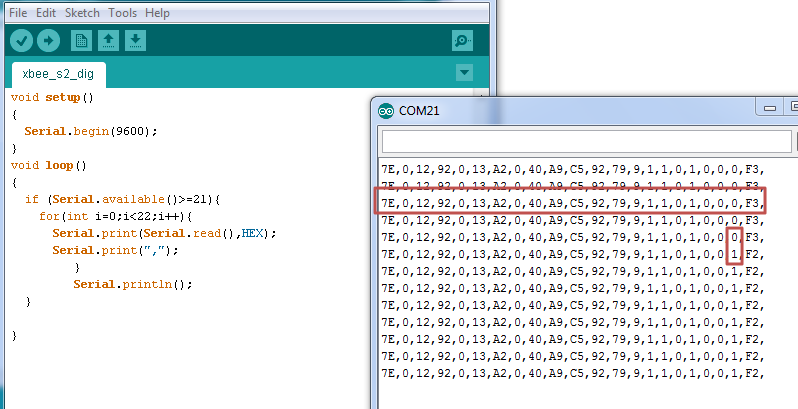 The next 2 bytes represent the length of frame starting from Frame type & ending before Checksum. In our sample here its 0 12 .The second byte 0x12 in HEX is equal to 18 in Decimal.You can see total 18 bytes after this value 0x12 & before the checksum F3. The other Frame types are as seen below. Byte no. 4 to 11 represent the 64 bit address from where the data sample is received. Byte 12 (MSB) & 13 (LSB) is the 16 bit address of sender. Byte 14 represents Receive options. 0x01 is for packet acknowledged & 0x02 means the packet is a Broadcast one. Byte 15 represents Number of Sample sets included in the payload which is always set to 1. Bytes 16 & 17 represent the Digital channel mask.Indicates which Digital I/O lines on the remote radio have sampling enabled.In our case we’ve enabled D0 as Digital IN. n/a means not available or not defined. i.e the bit D0 only is enabled. Byte 18 is the Bit mask field that indicates which analog I/O lines on the remote radio have analog sampling.In our sample it is 0 , i.e No analog samples. If you receive 0x0 in the first digital sample byte & 0x1 in the second one, that indicates high voltage (level 1) is being received only on pin D0. The last one is the checksum which is the 8 bit sum of bytes from offset 3 to this byte. Note that if Analog lines are enabled you receive another single byte before this checksum representing the Analog data. You can watch the byte no. 20 which is the last but one in the Frame data.This changes to 1 when the Door switch is closed & changes to 0 when the door switch is open. 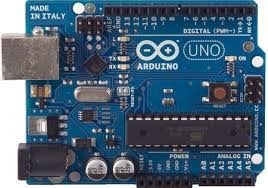 Now we shall upload a little modified code on to Arduino. 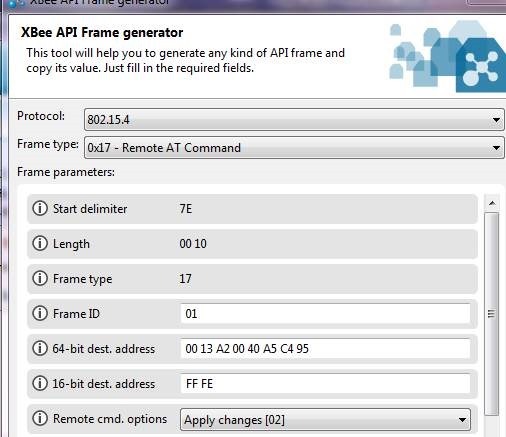 This tutorial explains how to control an I/O pin of a remote XBEE by sending API frames from a base XBEE. One of the radios works as a Base & the other one as Remote. 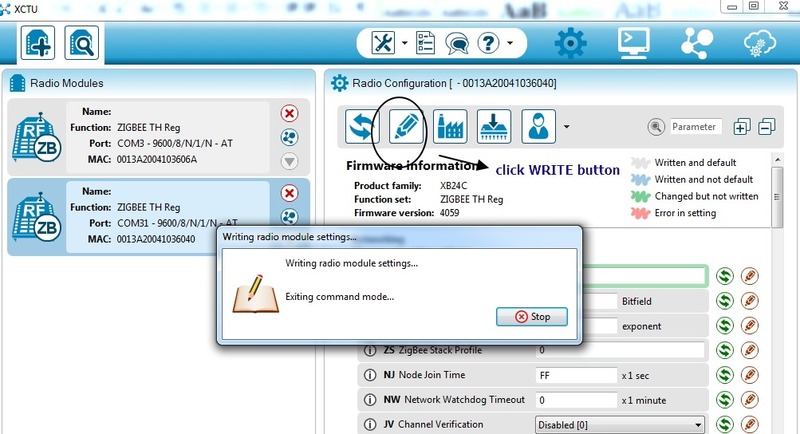 The Base Radio is mounted on USB explorer and connected to a PC.This Radio is enabled for API so that frames including AT commands can be transmitted. This is a unique number to every XBEE and is seen printed to the back of the radio. 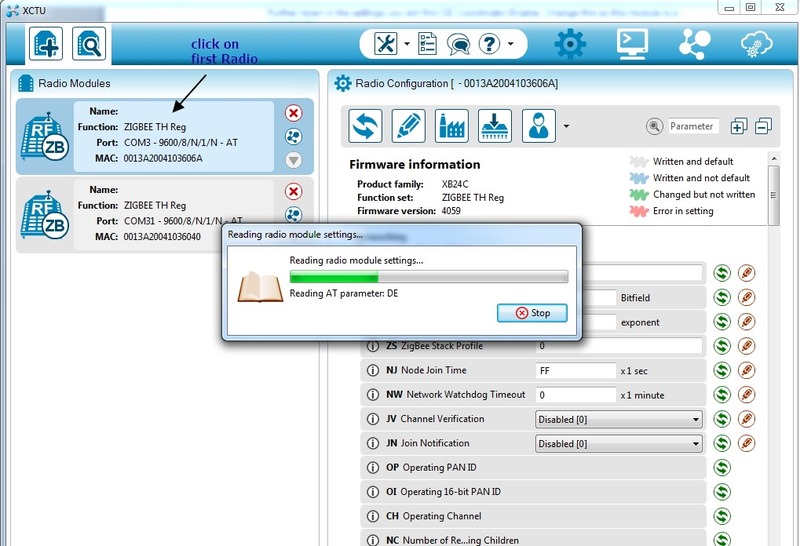 We make use of the new generation XCTU software to configure the Radios. First we shall configure the Remote XBEE . The pin 19 (DIO 1) is enabled low and ensured that the radio is in operating on same Channel,PANID & Baud rate as the Base radio. 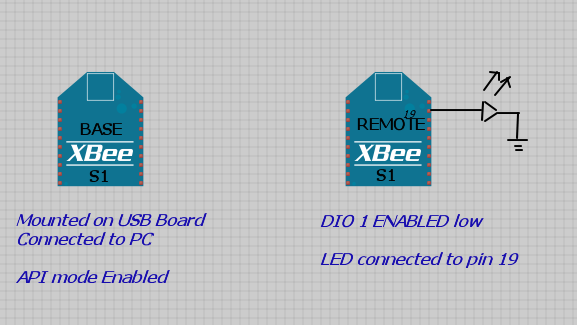 We shall use the same USB explorer to configure both the XBEEs.After configuration the remote XBEE is removed and mounted on to the XBEE breakout board & the Base XBEE is used with the USB explorer which is connected to a PC. 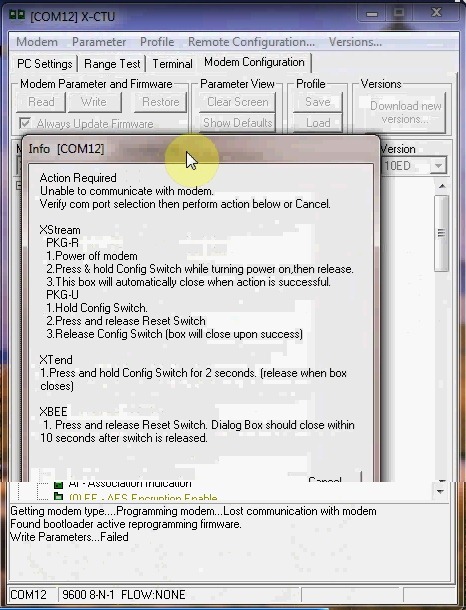 Plug on the remote XBEE to the USB explorer & fire up the new XCTU software. On the welcome window click on the second icon to start Searching for the connected XBEEs. The USB ports are displayed .In our case XBEE is connected to serial port COM128.Select it & click on NEXT. Port Parameter window opens. Ensure that the selection is Baud Rate – 9600 , Data bits – 8 , Parity – None, Stop bits – 1 & Flow control – None. Now the Device connected to the serial port is detected , which is our Remote XBEE. The remote XBEE Radio module appears with MAC address. Select the Radio to load the parameters. Each S1 radio can be assigned a 16bit Source address( MY address) & a 16 bit Destination address (DL).This is user assigned. Provide a MY address of 0011 for this Remote XBEE. The DL address entered here is 0010 ( which is the MY address of Base radio). 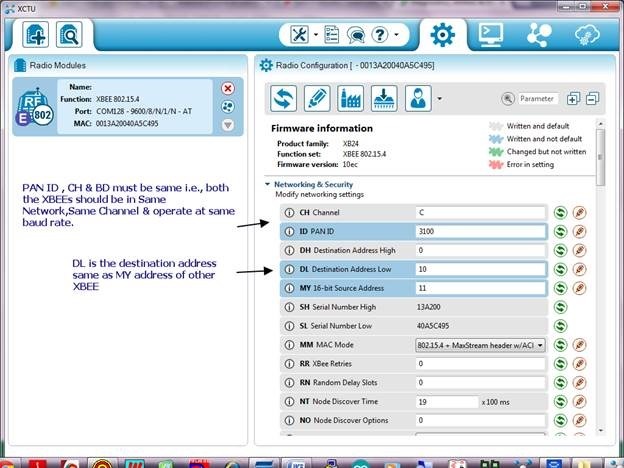 Assign a channel say, C & PAN ID as 3100 .This is also user defined. 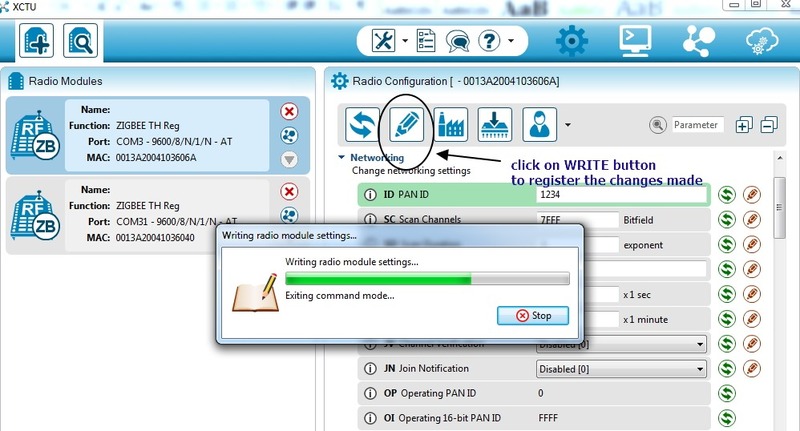 Ensure that the Base Radio also is configured for the same channel & PANID. Scroll down the list to select D1 DIO1 configuration.Change it to 4 (LOW).This makes the physical pin 19 LOW initially. Click on the WRITE button to save the changes made. The configuration for Remote XBEE is done. Close the XCTU. Remove the XBEE from the USB explorer & plug it to the XBEE breakout board. An LED is connected to pin 20 of this breakout board.The short lead of LED is connected to GND. As we’re using a blue LED (3v ) there is no need of a limiting resistor . Pin 1 of the breakout board is connected to a +5v supply & pin 10 to GND. As the breakout board has on board 3.3v regulator , we can safely use a 5v supply. Fig : Remote XBEE plugged on a breakout board .Pin 19 connected to an LED. Now plug the Base Radio on to the USB explorer & start the XCTU software. 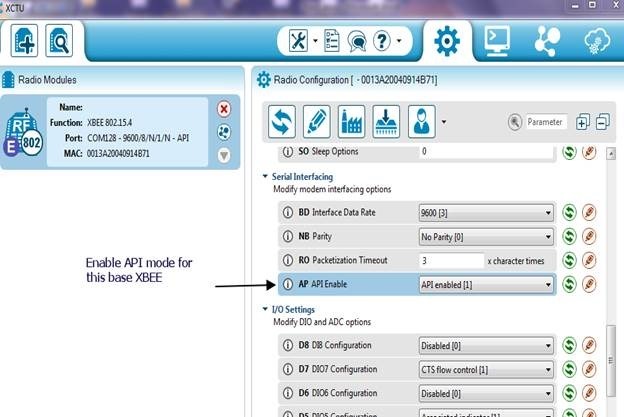 As we did for the previous XBEE ,click the Search icon & then select the Serial port where the USB explorer is connected.On the next screen ensure that the port parameters like Baud rate is same as we selected for the previous XBEE. Click on Finish & then ADD Selected Devices. 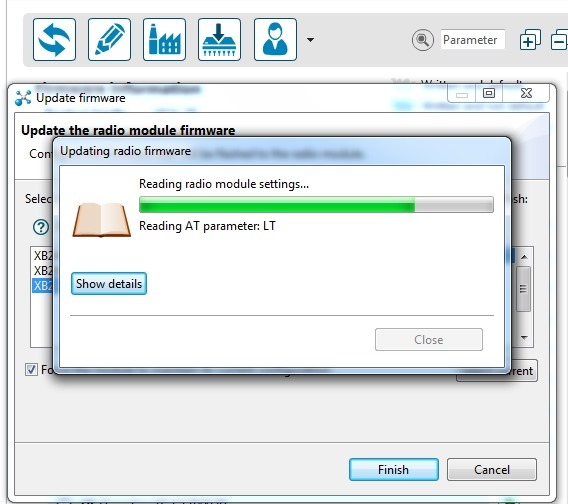 Click on the selected Radio to load the parameters. 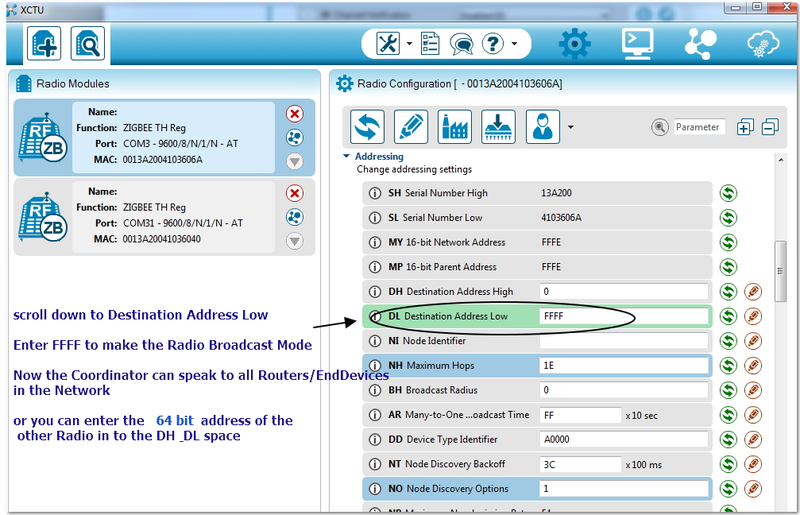 The DL Destination Address is set as the MY address of remote radio.The operating channel & PANID should be same as that of remote. Scroll down further to set the API mode Enable. 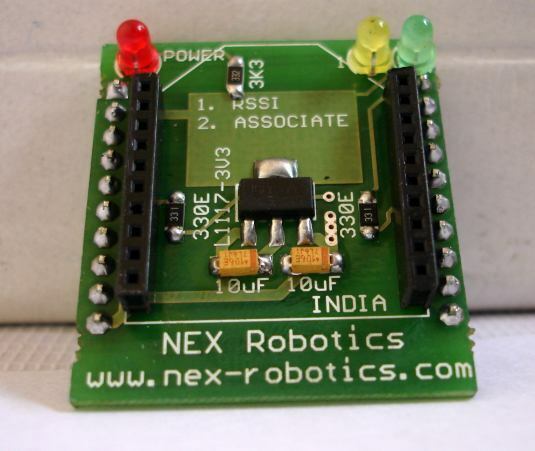 Now if you switch on the power for the remote XBEE , you can see the ASSOC LED on the breakout board blinking. This indicates that both the Base & Remote XBEEs are paired. From the XCTU window Switch to Console working mode by clicking on the Terminal icon next to Settings icon. At the right side corner you can see the “API CONSOLE , Status :Disconnected” message. 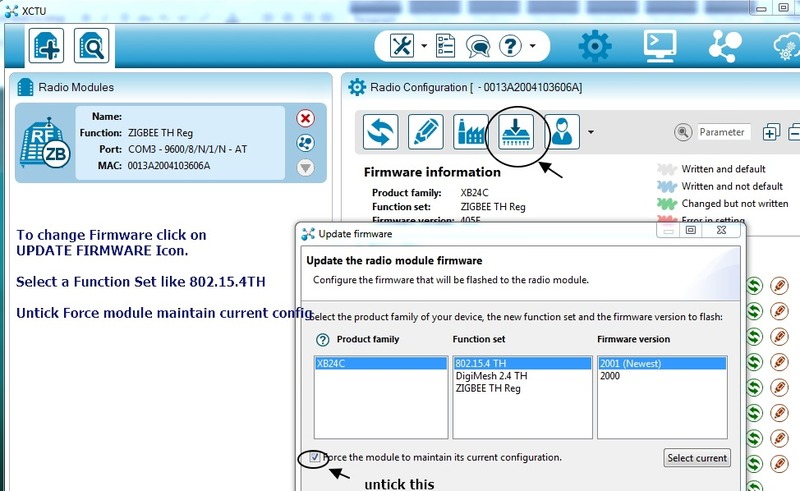 To open the serial connection with the radio click on the first icon on the left. Now the API CONSOLE Status is Connected. Click on the green + symbol seen at the bottom to get the Frames Generator window. 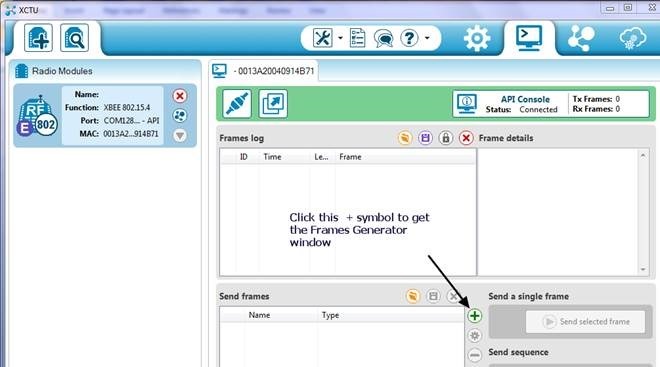 Provide a Frame name , say , High & then click on the Generator icon below. 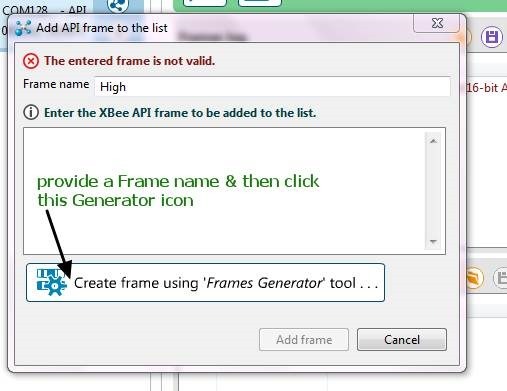 Now the XBEE API FRAME GENERATOR window opens. 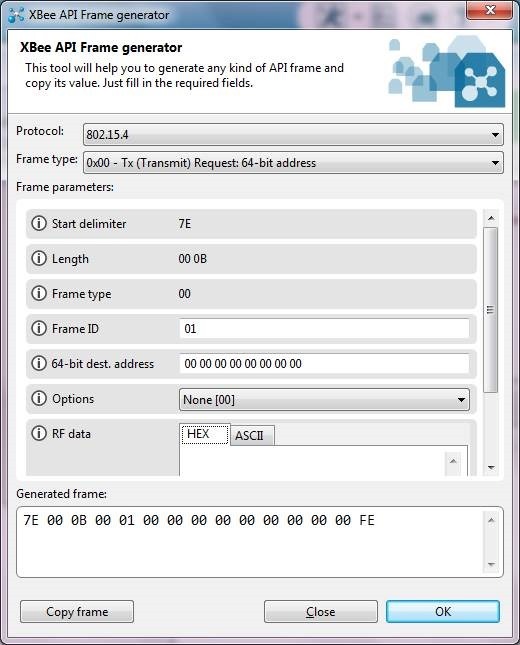 The Frame type is 0x17 which is REMOTE AT COMMAND REQUEST. 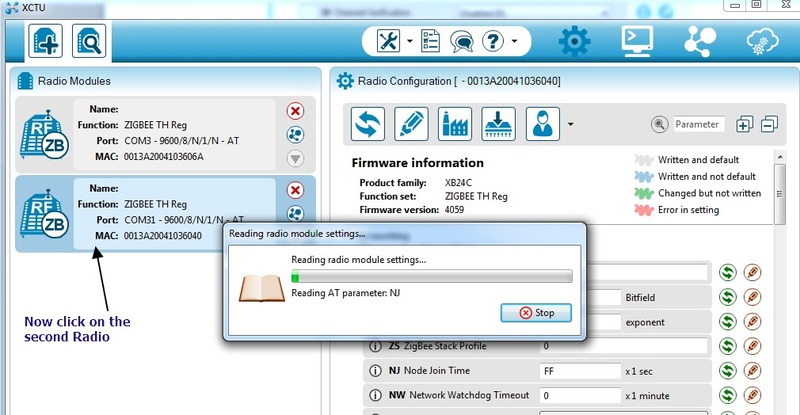 Sending commands over the wireless network to configure a Remote radio can be achieved only in API mode.The AT command can be sent wirelessly to change the state of a Digital output. 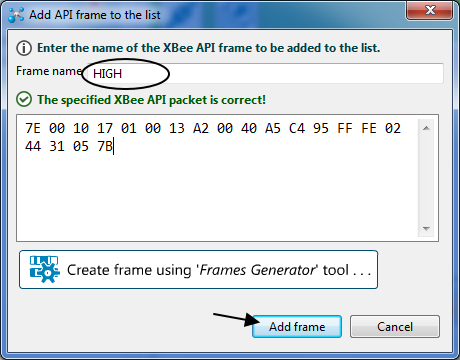 After selecting 0x17 as the Frame type , enter the 64 bit Destination address of the Remote Xbee. Next one is the 16 bit Destination Network address.Set this to 16bit address of Destination device,if known.Set to 0xFFFE if the address is unknown , or if sending a Broadcast. Next one is Remote command options which is a Bit field to enable various remote command options. 0x02 is to Apply changes on remote.A value of 0x01 disables ACK. Next is the actual AT command. Click on the ASCII tab and enter D1 ,as we need to toggle the state of DIO 1. The next one is the Parameter value.If no characters provided here , the state of DIO 1 is queried. Set this to HEX value 0x05 to send a HIGH value & set to 0x04 to send a LOW value. Final value is the checksum. Select the HIGH frame & then click on the “Send single frame “ green arrow button.The LED at pin 19 of Remote XBEE glows. Select the LOW frame we’ve created & click the Send button.The LED at remote end goes Off. 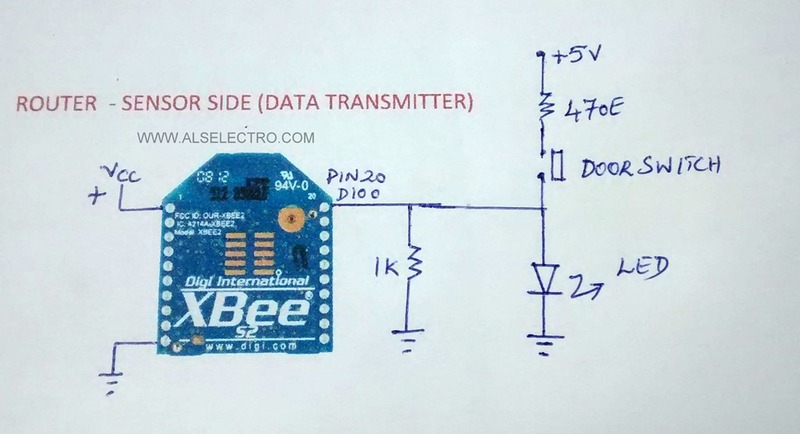 In this post we shall see how to line pass Analog signal between XBEEs. We make use of S1 series (802.15.4) XBEEs for this demo.Do not try this with S2 series XBEEs ,as S2 do not support I/O line passing. 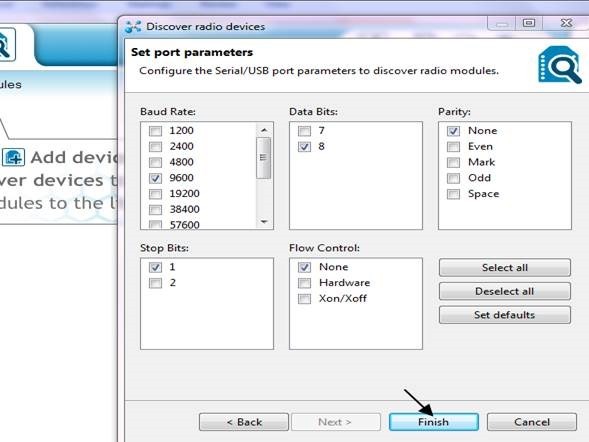 Configure the S1 modules for point to point communication using XCTU. 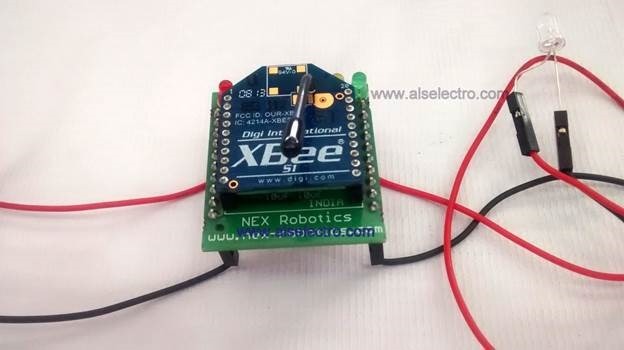 An XBEE adapter is used to plug on XBEE to breadboard.Pin 1 is connected to +ve rail & pin 10 to GND. 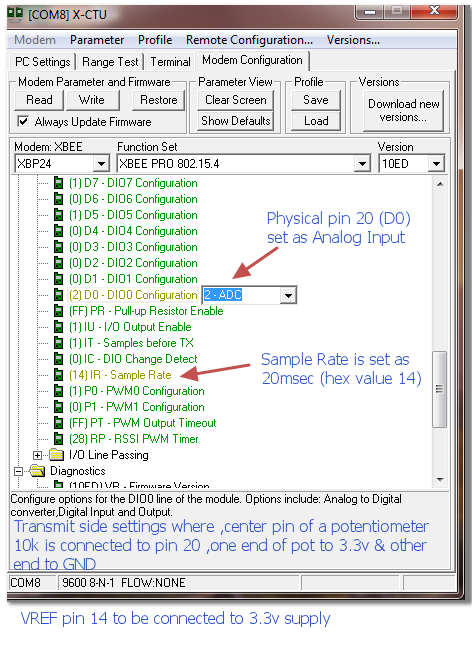 A 10k potentiometer is used to vary analog input.The center pin of pot is connected to pin 20 of XBEE which is defined as Analog input (ATD02) .The sampling rate at which data is collected is set to 20 msec (hex value 14 – ATIR14). One end of pot is connected to +ve rail & other end to GND. 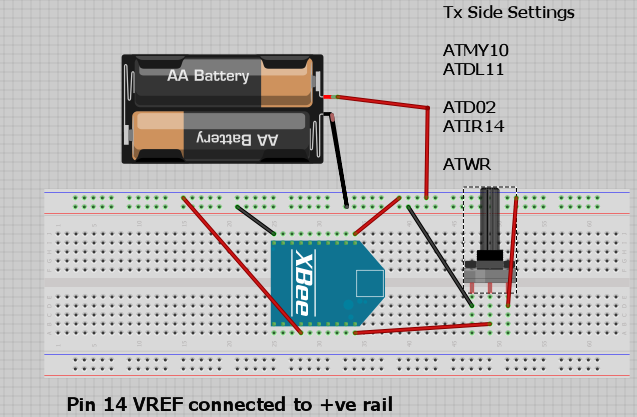 Pin 14 which is the VREF is connected to the +ve rail.This connection is a must which gives XBEE a reference for what voltage an analog sensor is working. At the Receive side an LED is connected to pin 6. This pin 6 is the PWM 0 of XBEE S1 .PWM acts like Digital to Analog converter to output an analog signal. Setting is done in XCTU (ATP02) to make PWM0 as PWM output. The I/O addressing is set to source address of Transmit XBEE. This is set using ATIA10. Now if you vary the potentiometer at Transmit side , the LED varies intensity at Rx side. 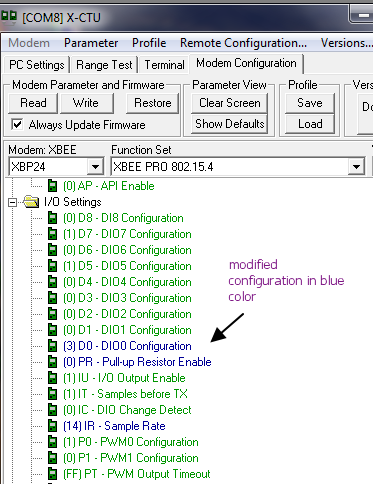 In this post I shall explain how to recover a non responsive XBEE modem. I’ve an USB XBEE adapter on which a S1 PRO modem is plugged on. When I tried to reconfigure a S1 PRO (802.15.4) Modem , it went unresponsive.Any attempt to write Firmware failed & Recovery process was unsuccessful. Before starting the Recovery process I understood that I’ve to Optimize the USB – Serial port settings so that the PC can respond to the XBEE USB adapter. An XBEE USB adapter uses a FTDI chip .By default the FTDI drivers have a latency time of 16msec & Transmit/Receive size of 4096 Bytes. The PC doesn’t get the Bytes fast enough to respond to the Serial device , before it times out.So any attempt to recover or update an XBEE on USB adapter may fail. 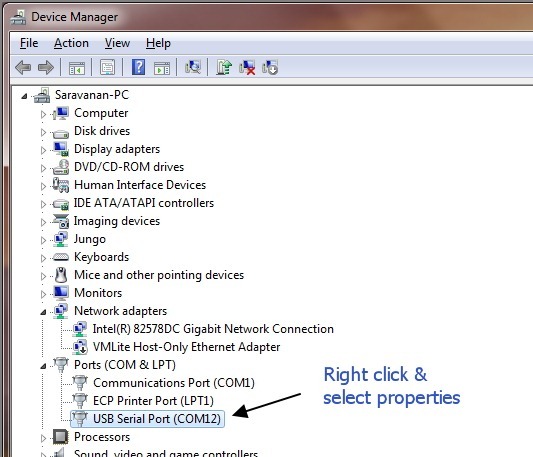 To optimize the port settings I opened the Device Manager & Right clicked the USB Serial port where the USB adapter is connected & selected Properties. Under Port Settings Tab I clicked on Advanced..
& Changed the Receive as well as Transmit Bytes to the lowest one 64 from the drop down list. Clicked OK & closed the Device Manager. Now I pulled out the Modem from the USB adapter. 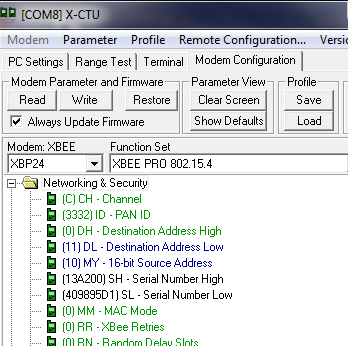 I confirmed that ,under Modem configuration of XCTU , correct type of Modem is selected.Mine is S1 PRO ,so I selected XBP24 & confirmed that firmware is XBEE PRO 802.15.4 . I selected the latest version 10ED. I check marked ‘Always Update Firmware’ & clicked Show Defaults. Now I clicked Write button (note that XBEE is not yet plugged on to the USB adapter). A new INFO window appeared requesting action. At this point I plugged on the S1 module on to the XBEE USB adapter with Reset button kept pressed.Care was taken to confirm that pin 10 goes to GND & pin 1 to supply. Now I released the Reset button to see the Reprogramming in Action. 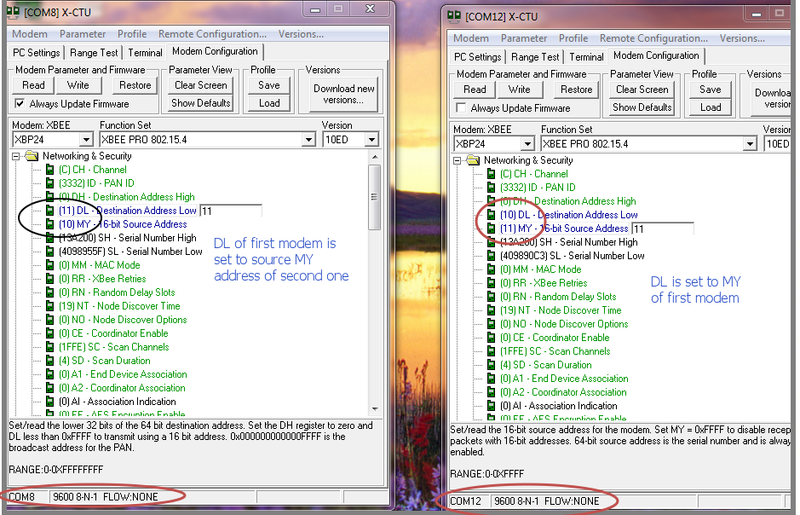 The Modem has been successfully recovered & Test/Query operation in XCTU recognizes the Modem. 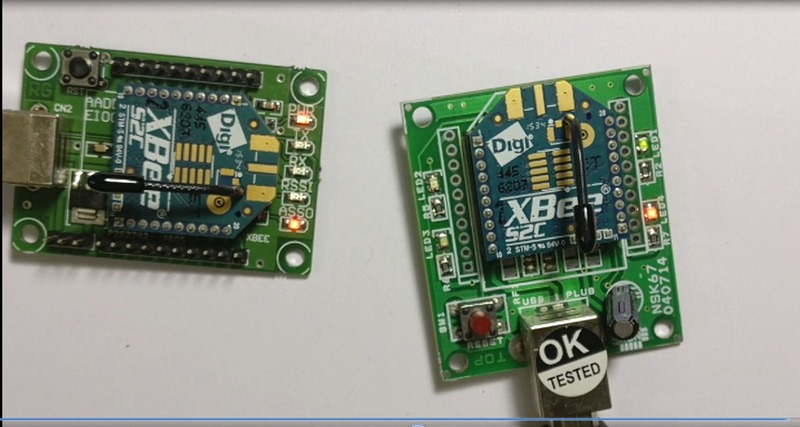 XBEEs can be used without a micro controller thus reducing the cost of the project.In this post we shall see how to configure S1 series XBEEs for Digital In/Out. 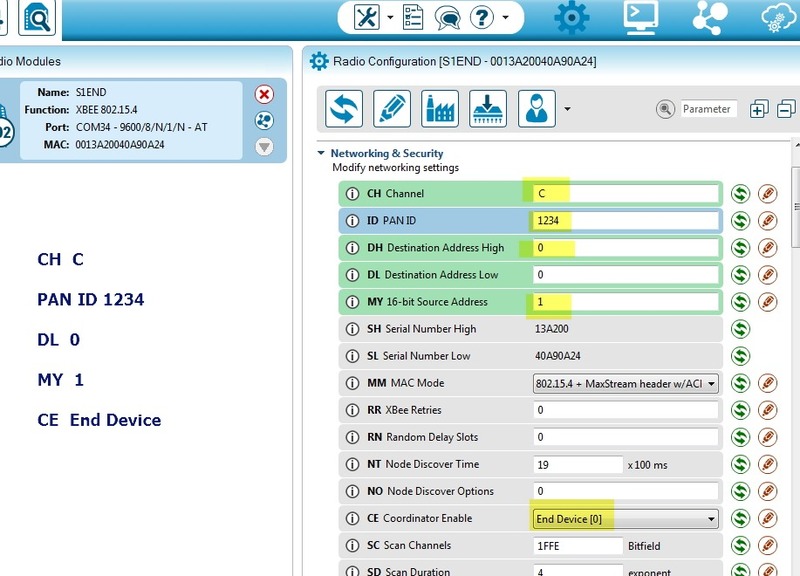 Two Series 1 XBEE Radios are configured to communicate with each other initially. 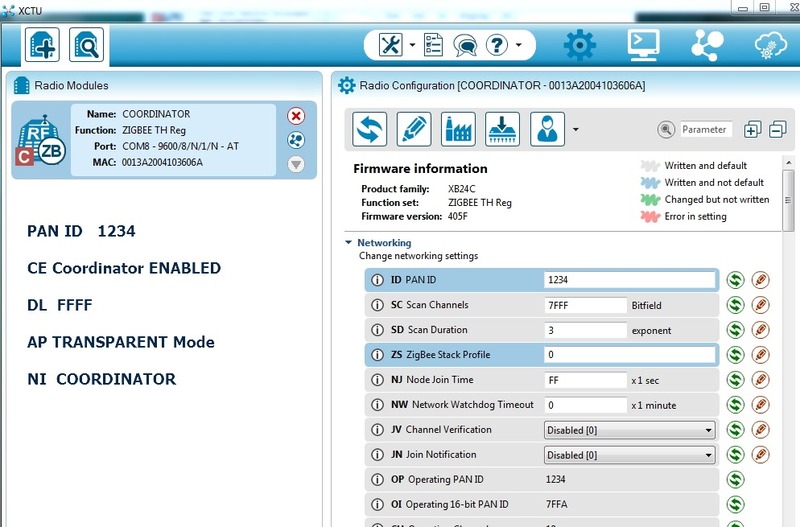 XBee radios can be configured for up to 8 digital input pins that can directly control the output pins on a second radio. Following is the connection detail for the transmit side XBEE. A push type micro switch is connected to physical pin 20 of XBEE (on the right top of XBEE).This pin is Digital I/O pin 0 & is configured as Digital Input using ATD03 command. The other side of the switch gets connected to the positive bus. 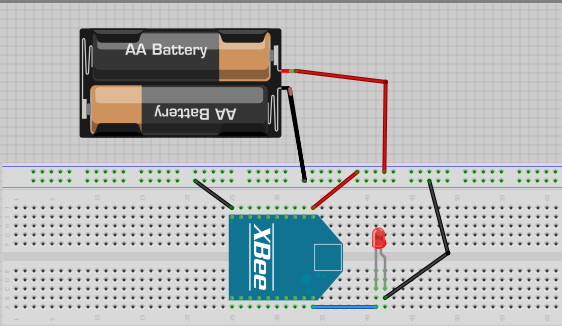 Add a 10K resistor between the negative power bus and the side of the switch that connects to the XBee. This acts as a pull down resistor, which ensures the input is connected to ground (low) when the switch is not being pushed. 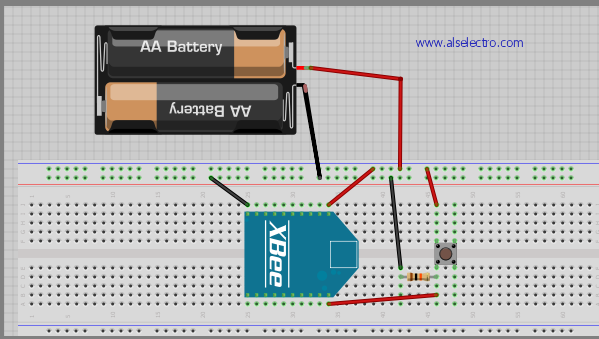 Two AA batteries in a holder supplies 3v DC which is enough to operate an XBEE. The Transmit side XBEE is configured using XCTU . The PAN ID is set to 3332 (you can set any value within FFFF ).Please note that the Receiver should be also set for the same ID. The DL Destination Low address is the source address (MY) of receiver XBEE. 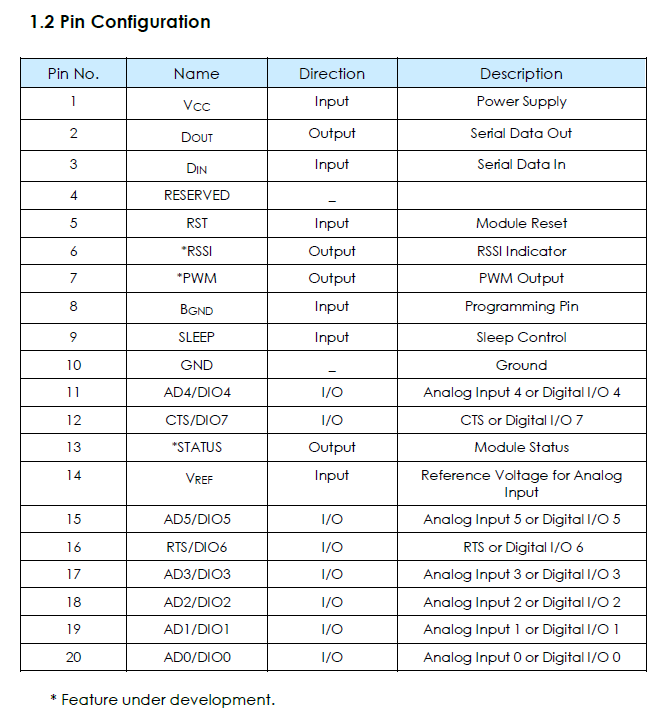 Under I/O settings configure Data I/O pin 0 (DIO0) as hex 3 which makes physical pin 20 as Digital Input.Disable the internal pull up resistors for all pins under PR . 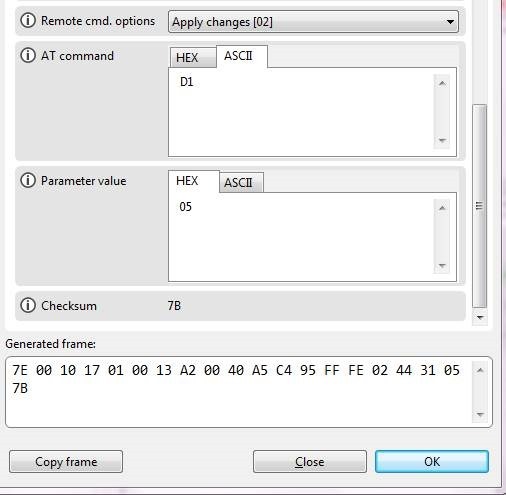 The IR Sample rate is set to hex value 14.This equals 20 msec in decimal.The I/O sample rate sets how frequently to report the current pin state and transmit it to the destination address. You can enter into command mode by typing three consecutive +++ symbol. Following is the screen shot of terminal window verifying the settings we made. To the Receiver side XBEE , an LED is connected to pin20. 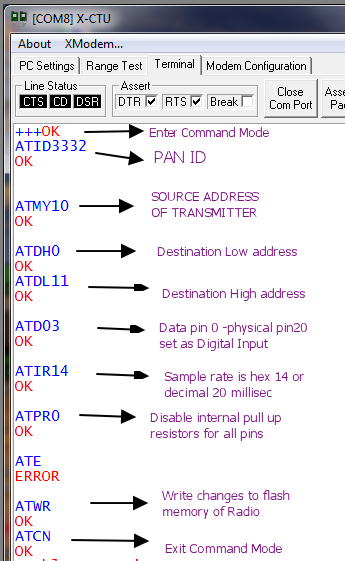 The destination address is set to Source (Transmit) address & Data pin 0 (physical pin 20) is set to LOW on start up using command ATD04. 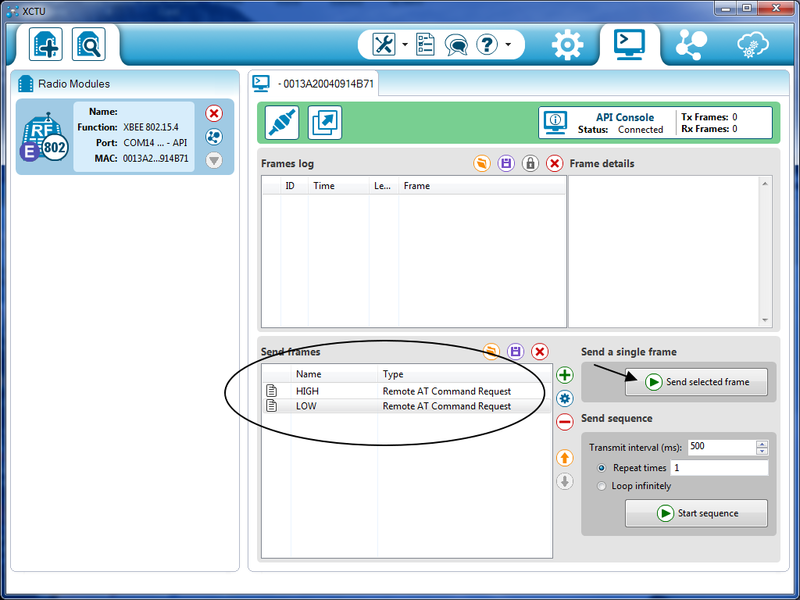 The I/O input address is set to Source address of the transmitter using ATIA command. As the source address of transmitter is 10 , type in ATIA10. Do not forget to write the changes using ATWR command. 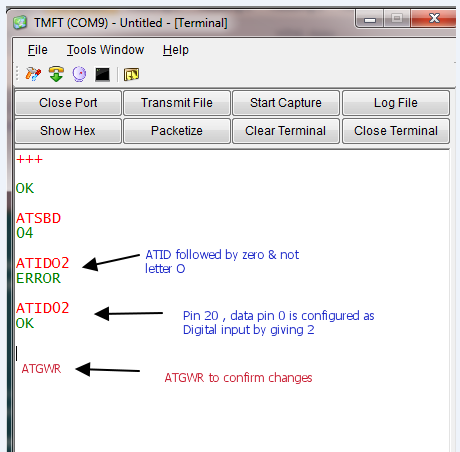 As soon as you exit the command mode you may get stray data at the receiver terminal.This is because the transmitter pin 20 is open or not yet connected to switch. 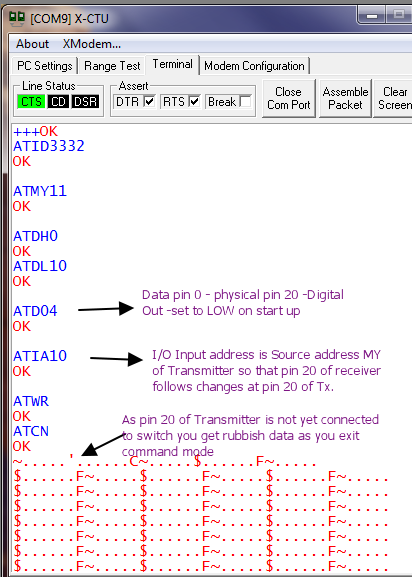 Now if you press the switch at transmitter end , High is applied to pin 20 of TX. This condition is transmitted to other end.The RX XBEE pin 20 now goes High , glowing the LED. 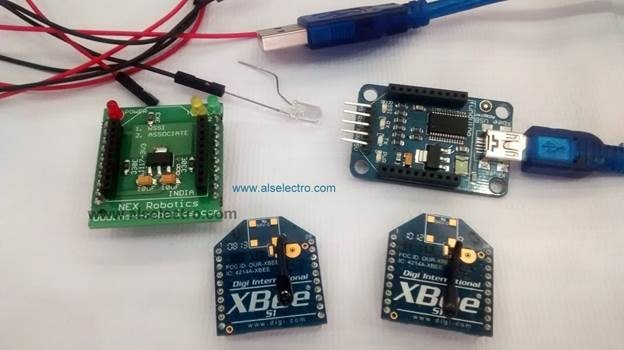 XBEEs can be used alone , without a microcontroller.This is called XBEE DIRECT.It enables projects that are truly wireless & saves space,power & cost of the project. Tarang XBEEs have limited I/O pins.By default all I/O pins are DIGITAL OUTPUTs .Some of the pins can be configured as DIGITAL or Analog INPUTs.TARANG modules do not support Analog Output. Besides transmitting data & changing state of digital pins , no logical decision can be made in XBEE Direct mode. As you can see above in the pin configuration there are 8 DIGITAL I/O pins out of which 6 are multiplexed for Analog Inputs. Two of the pins are multiplexed for serial hardware handshaking signals. RTS – Request To Send pin 16/DIO6. In some cases, simple TX / RX connections are not enough to ensure your data gets delivered intact.In such cases ,Serial flow control can help make sure your data is not lost in transmission. A transmitter raises its RTS line causing interrupt on Receiver , asking “ can I send Data “. If Receiver accepts , it will assert its CTS line telling “ yes, you can send Data “. Handshaking is enabled in Tarang modules using command ATSHS .By default it is 0 , meaning No Flow Control.Change it to 1 ( ATSHS1) to enable handshaking.Generally handshaking is not needed unless there is another microcontroller in the project. 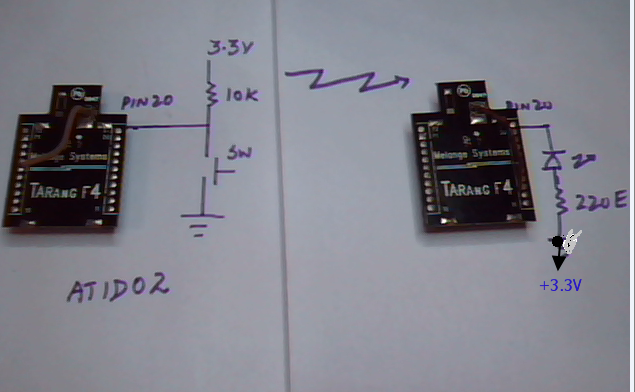 Note that Signal Strength RSSI debugging light (pin 6) is not yet implemented in Tarang F4. 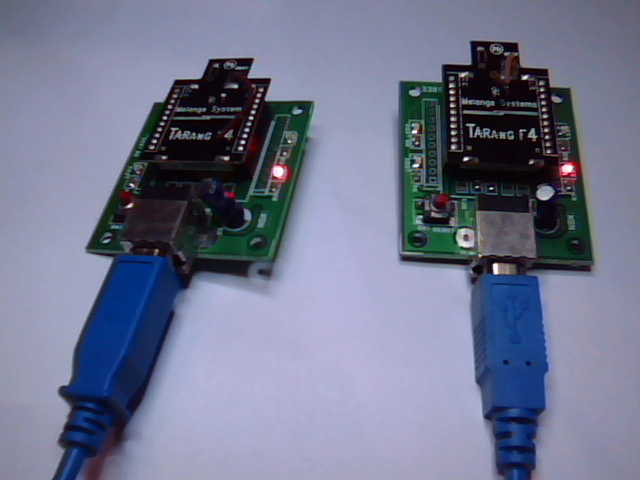 We shall use 2 Tarang F4 modems to test XBEE Direct functionality. Pin 20 of first modem (Digital I/O 0) is pulled high using a 10k resistor to 3.3v supply & then a switch is connected as shown. We shall declare this pin 20 as DIGITAL INPUT using command ATID. Enter command mode by issuing +++. & finally 2 which represents Digital Input. Do not forget to give ATGWR command to write changes to modem. 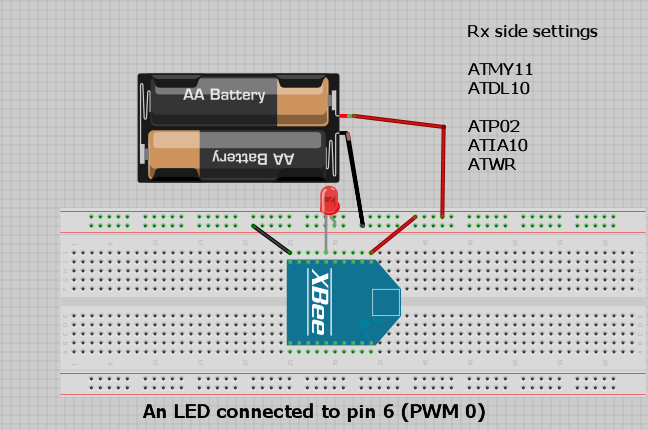 An LED is connected as shown to the second modem’s pin 20 through a 220E resistor to +3.3v supply. 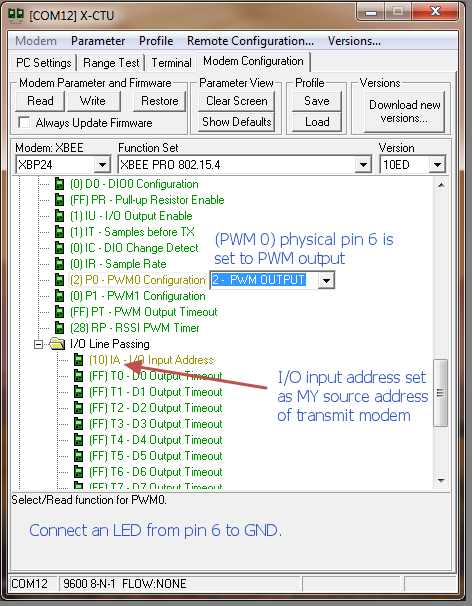 Now if you press the switch at modem 1 , the condition of pin 20( DIO 0) is transmitted wirelessly to other end.The pin 20 of second modem goes low , lighting the LED. Tarang modules are factory configured XBEE modules ready to use for Point To Point Communication.They operate within ISM 2.4 GHz frequency band & comply with Wireless protocol IEEE 802.15.4 (Series 1 XBEE). XBEEs can only talk at their configured Baud Rates.Default Baud is 3 , meaning 9600 bits per second Baud. 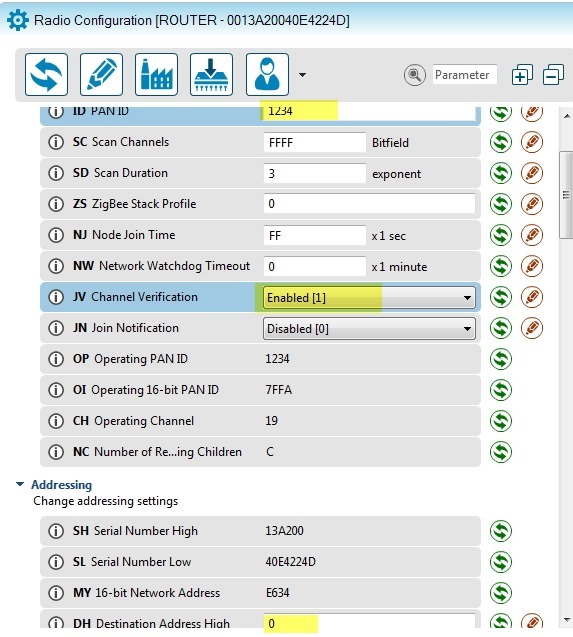 Changing the Baud rate is bit tricky & we shall see in this post how to achieve it. Future Technology Devices International Ltd. IC FT232 to provide USB to UART functionality.They do not need any external power source (USB powered) & handy to use. 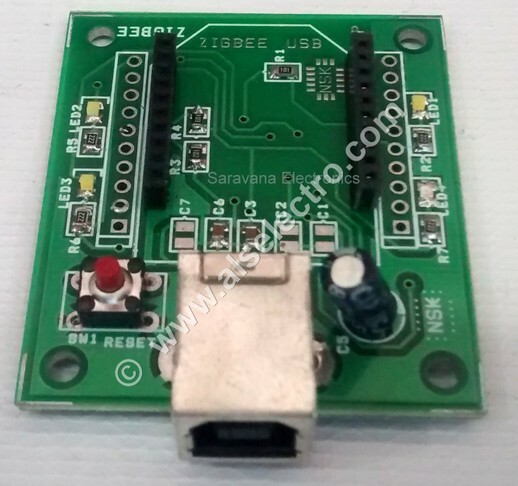 One of the Tarang module placed on USB breakout board is connected to an USB port of PC & same way the second one to another port. 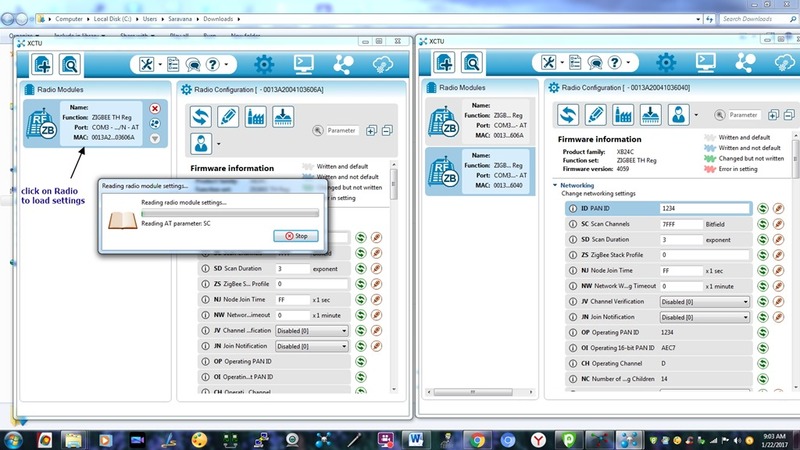 Now open the TMFT (Tarang Multi Function Tool) software .It’ll automatically detect the ports to which the modems are connected. 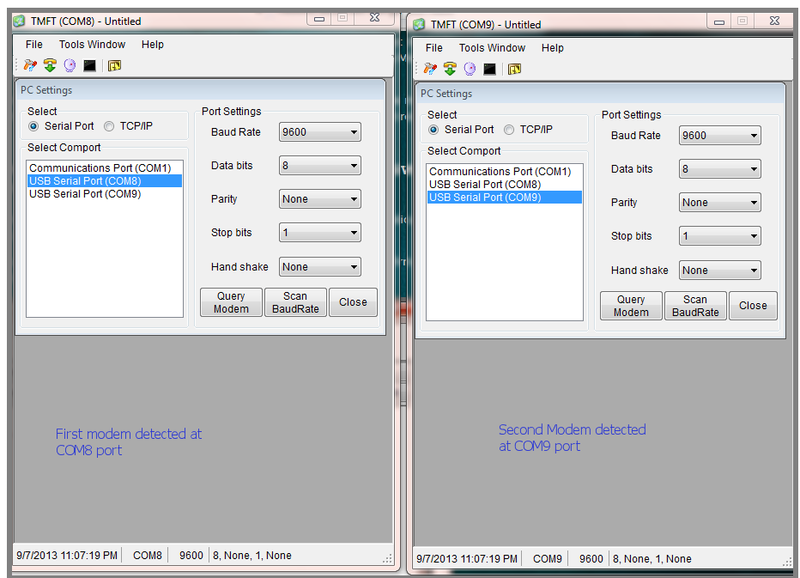 Following is the screen shot of two instances of TMFT software with modems detected. Select the first modem port & click on “Query Modem” to confirm Modem presence.Press CTRL+T to open the Terminal window. You can enter into Command mode by issuing three consecutive +++ symbols.The modem will confirm with OK . Unlike original XBEEs Tarang will remain in Command mode till it receives ATGEX command. Type in ATGRD command to Reset to factory defaults.Do not forget to issue ATGWR command to write changes on to modem’s memory. 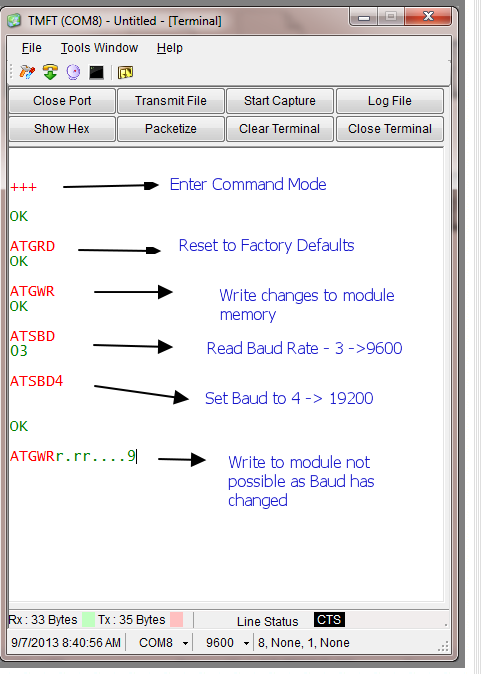 ATSBD is the command to read out modem baud rate. You get a response of 03 indicating the baud rate is 9600.To change this to ,say , 19200 type in ATBD4 . Now the Baud rate of modem has changed .But if you try to type in ATGWR to confirm , you get error because of baud mismatch between that of Terminal & modem. 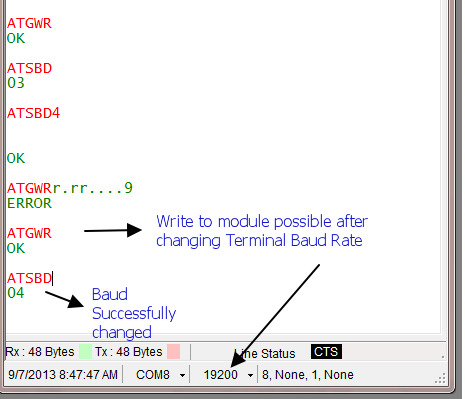 To accept any new command the Baud rate of terminal should match with that of modem.Click on the down arrow at bottom of Terminal near 9600.From the popping list select the new Baud rate 19200. Now if you type in ATGWR command , the changes will be recorded on to modem.To verify you can type in ATSBD to see 04 which is the new baud rate 19200. To exit command mode give ATGEX command . In similar manner change the baud rate of the other modem to 19200. Now the communication is restored between two Tarang modules on new baud rate.